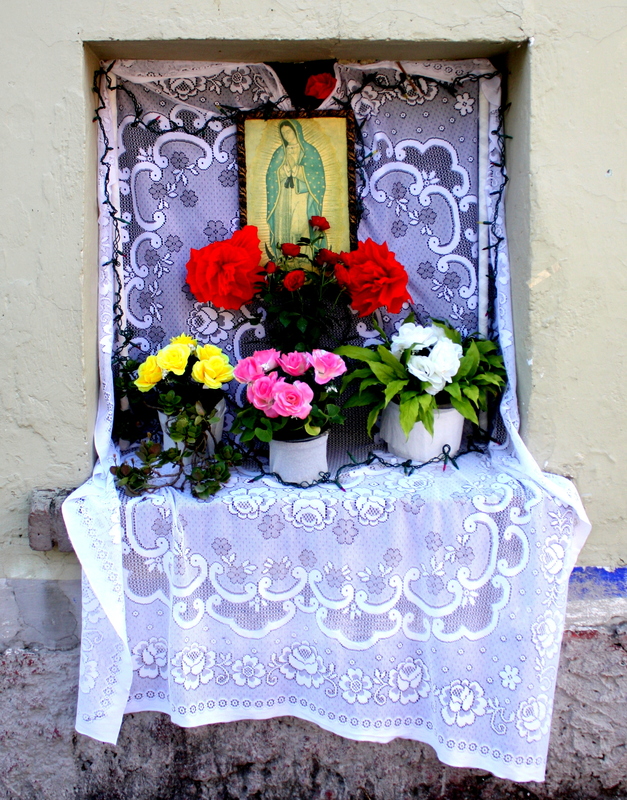 In Mexico, altars are not found just in churches. 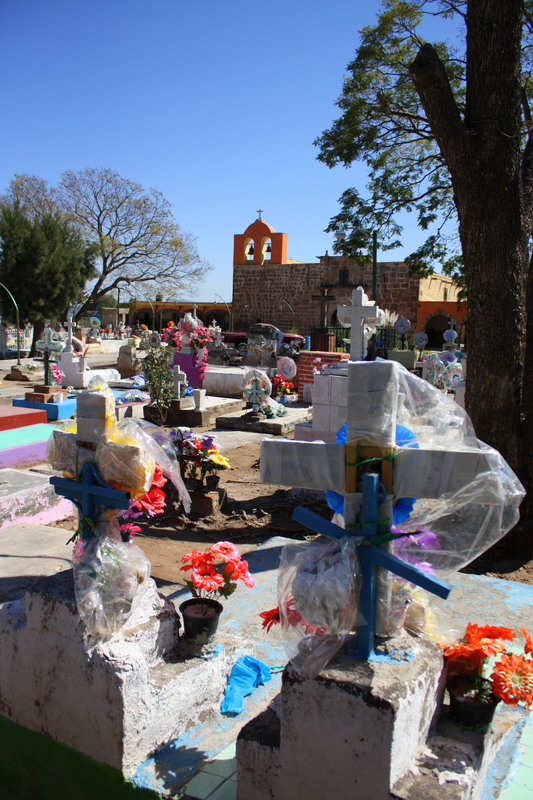 Makeshift and highly original altars appear on highways throughout Mexico as poignant reminders of traffic fatalities, and they’re a signature facet of the Dia de Los Muertos. 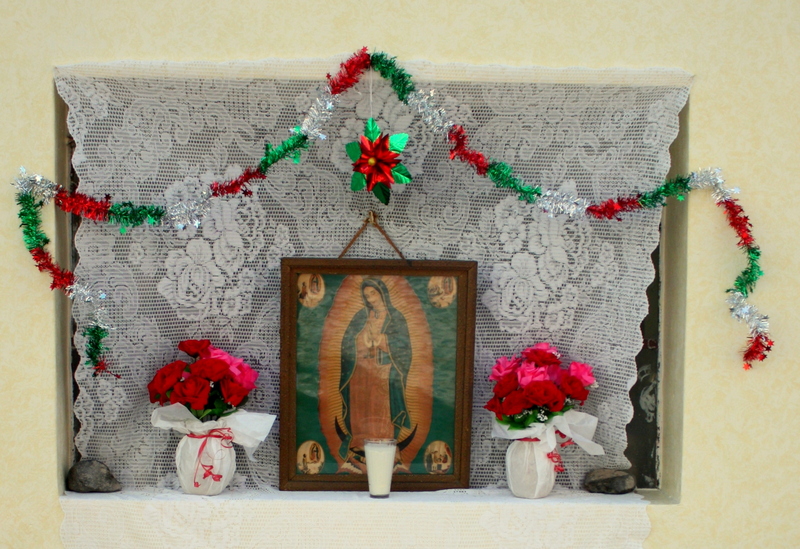 On each December 12, they honor the Virgin of Guadalupe, Catholic Mexico’s patron. 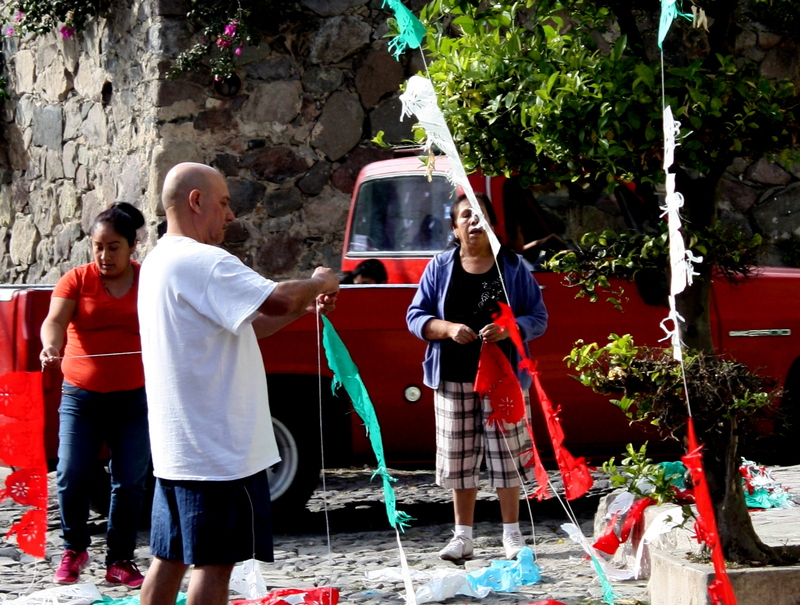 In many towns, several days of public observances lead up to the holiday, but on the afternoon of this December 12 in the village of Ajijic, families are still putting the finished touches on freshly constructed altars. 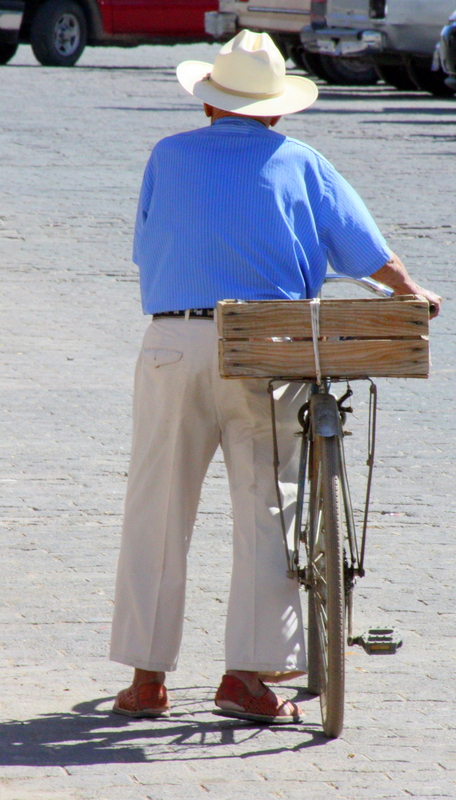 I walk the cobblestones streets capturing their images as I reflect on the tradition. 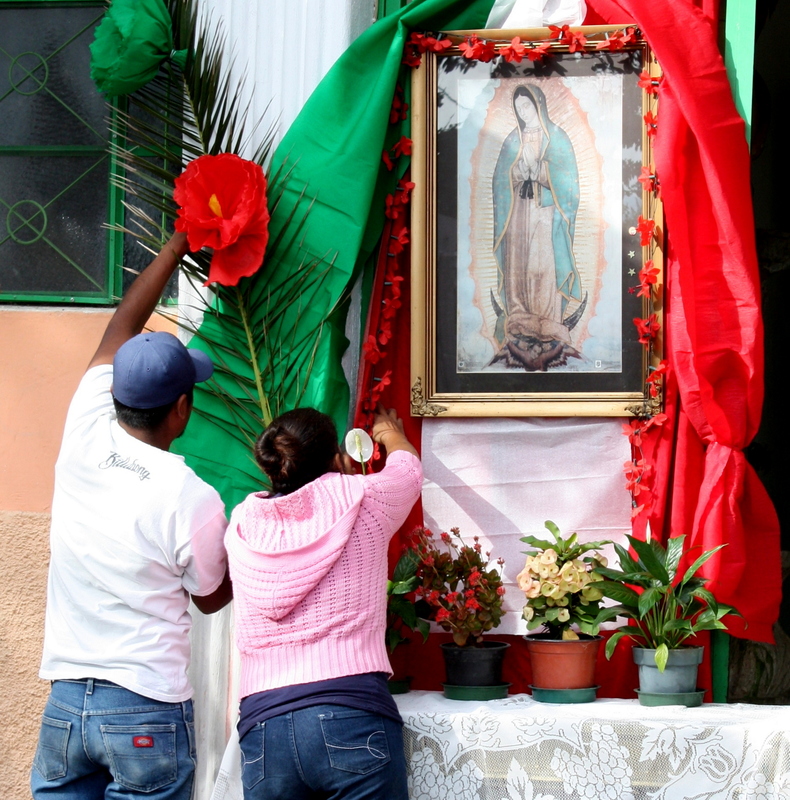 Catholicism has a long history of incorporating and reshaping local religious deities into its observances to ease the path to conversion, but perhaps nowhere has the practice taken a more remarkable turn than in Mexico. 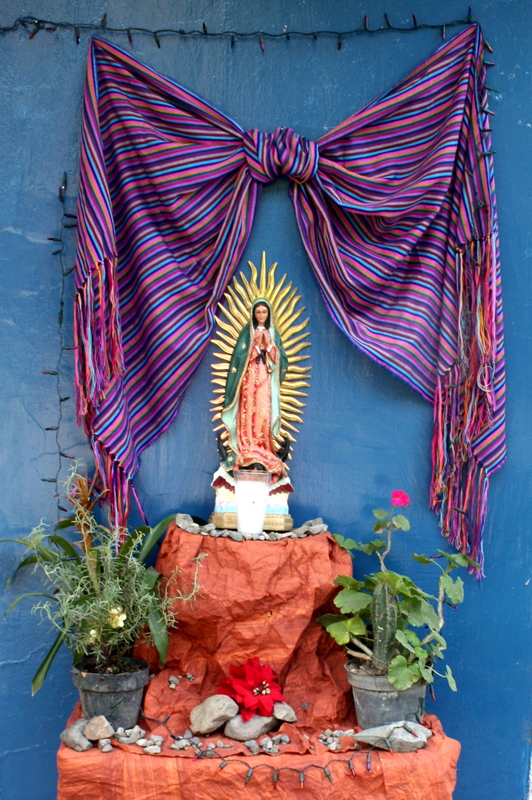 The legend has it that ten years after the Spanish Conquest, a Mexican native named Juan Diego saw a vision of a brown-skinned maiden on a hill near Mexico City which had once been the site of a temple to a female Aztec deity. Speaking to him in his native tongue, she asked that a church be built at that site in her honor. 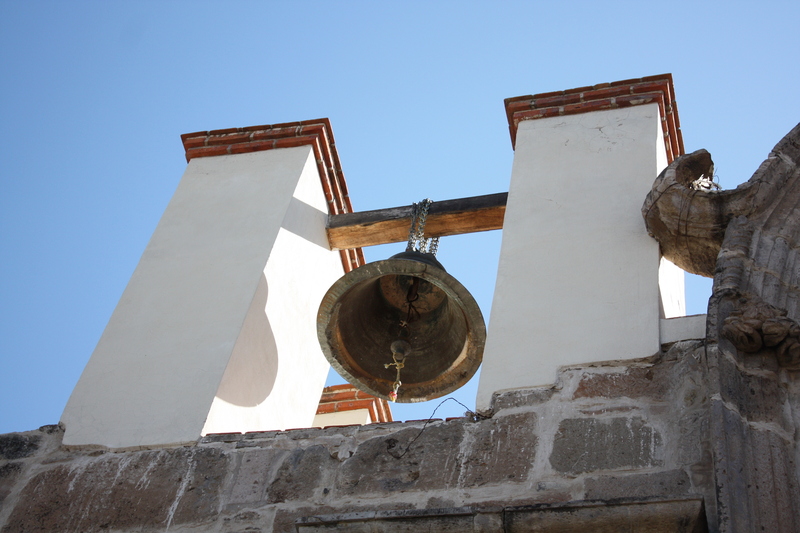 He was instructed by the city’s archbishop to return to the hill and ask for a sign to prove the lady’s identity, and in she healed Juan’s sick uncle. She also told him to gather flowers from the normally barren hill, where Spanish Castilian roses now miraculously bloomed. She arranged the flowers in his cloak, and when he opened it before the archbishop on December 12, they fell to the floor to reveal the image of the Virgin on the fabric. 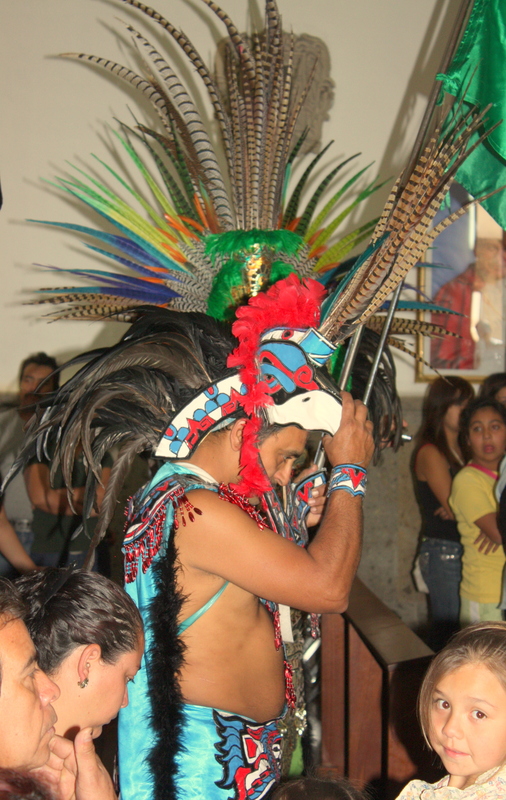 To the indigenous peoples, the vision was interpreted as a legitimization of their own Mexican origin. 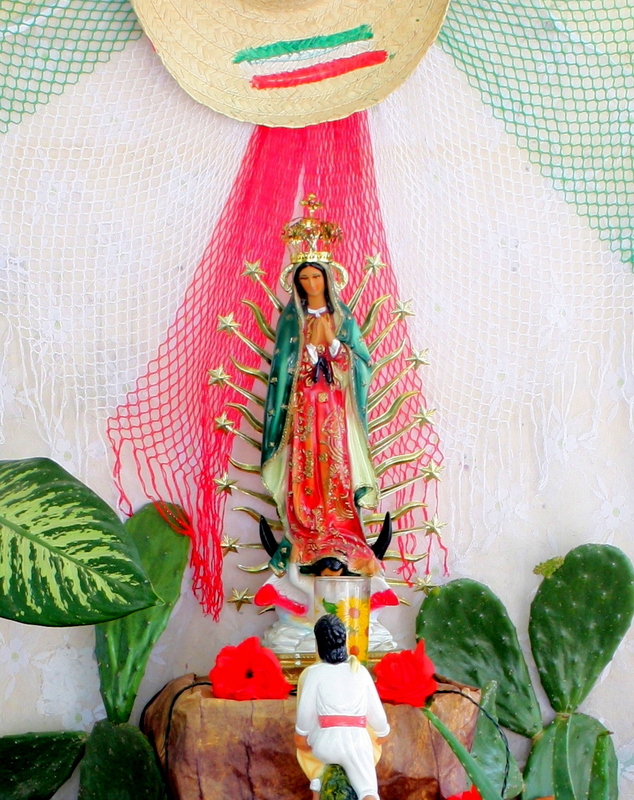 As the common denominator among the varied which make up Mexico, so it’s no surprise that the Virgin is sometimes referred to as “the first mestiza”, or “the first Mexican”. Part of the power of this image for indigenous Mexicans was the pre-Colombian symbolism with which it is imbued. 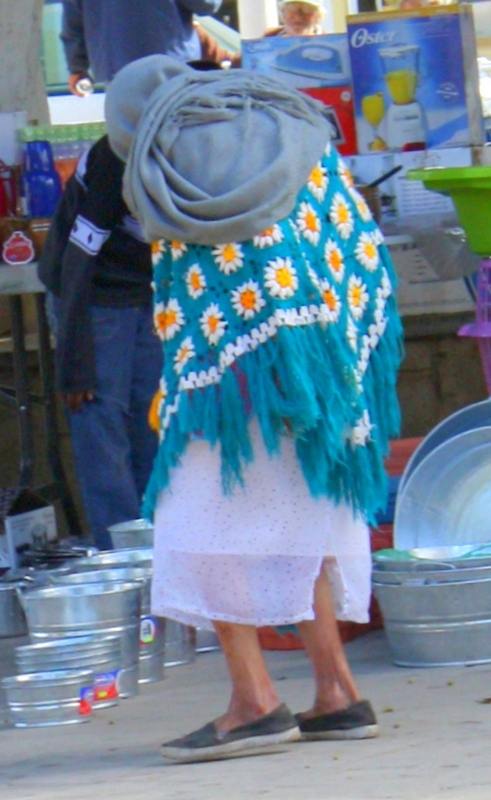 The blue-green color of her mantle was once reserved for the divine couple Ometecuhtli and Omecihuatl. Her belt symbolizes pregnancy and a cross-shaped image symbolizing the cosmos and called nahui-ollin, is inscribed beneath the image’s sash. 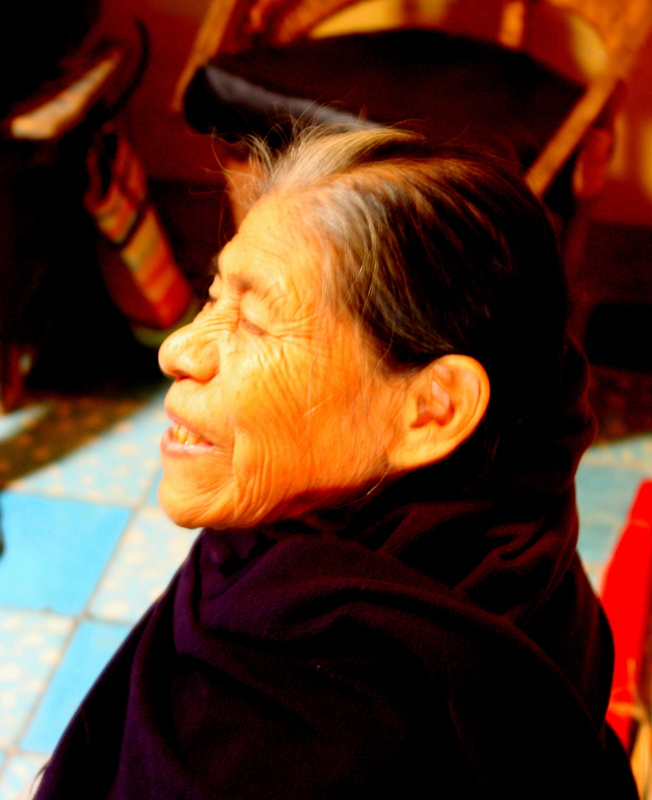 She was also called “mother of maguey,” the source of the sacred beverage pulque, which was also known as “the milk of the Virgin.” The rays of light surrounding her are interpreted to represent maguey spines. 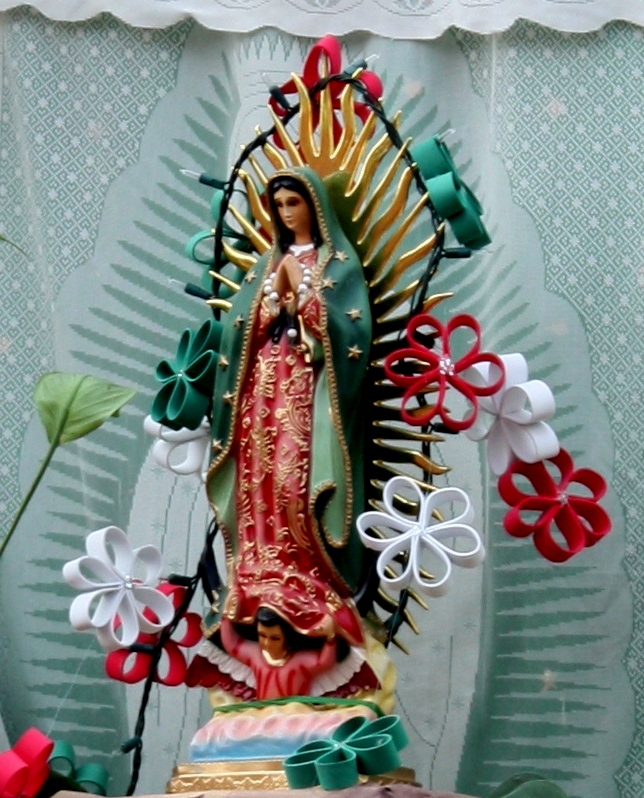 Although the Virgin is the recognized religious symbol of Catholic Mexicans, she is also closely intertwined with the spirit of Mexican nationalism. Mexico’s first president changed his name to Guadalupe Victoria in her honor, and patriot armies carried flags emblazoned with her image during Mexico’s War of Independence and the Mexican Revolution. 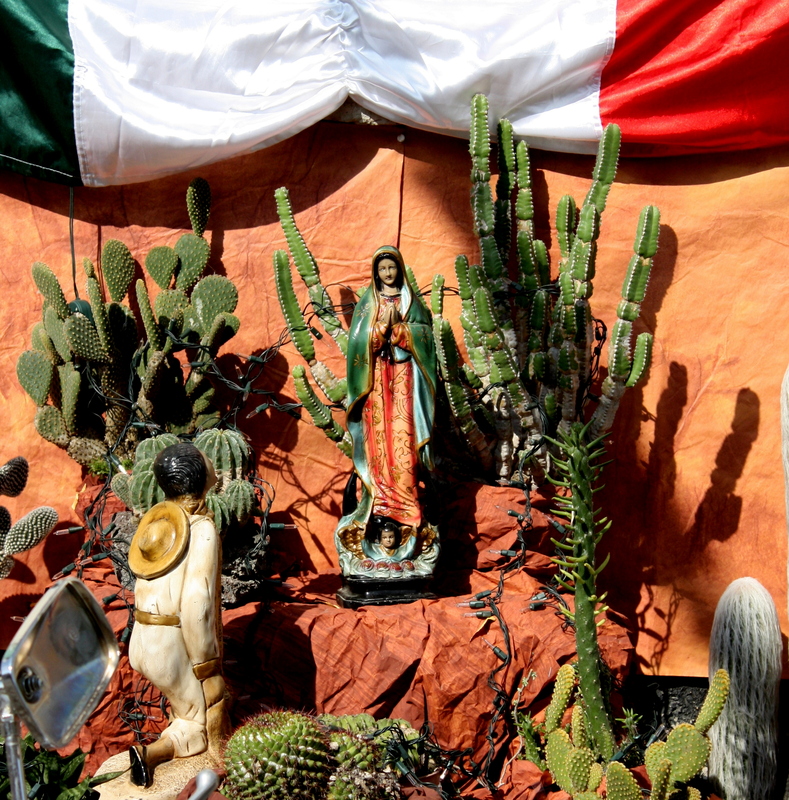 When the army led by Padre Miguel Hidalgo, the father of Mexican independence, attacked Spanish Royalists, they placed her image on brightly colored reeds and wore the same image on their hats. Her feast day was also written into the constitution. 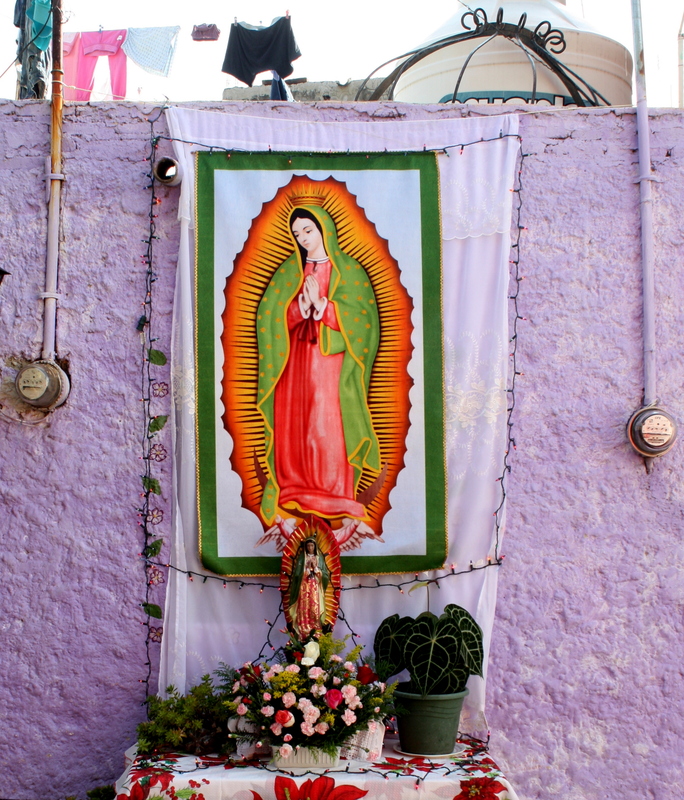 In this century, Mexico’s revolutionary Zapatista National Liberation Army named their “floating capital city” Guadalupe Tepeyac honor of the Virgin. 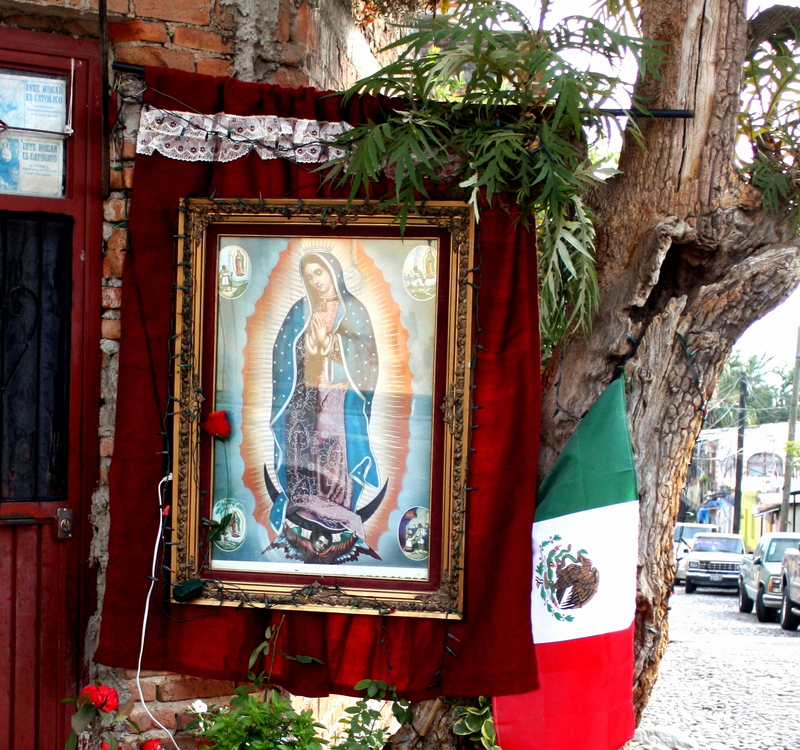 Nobel Literature laureate Octavio Paz wrote that “the Mexican people, after more than two centuries of experiments, have faith only in the Virgin of Guadalupe and the National Lottery”. 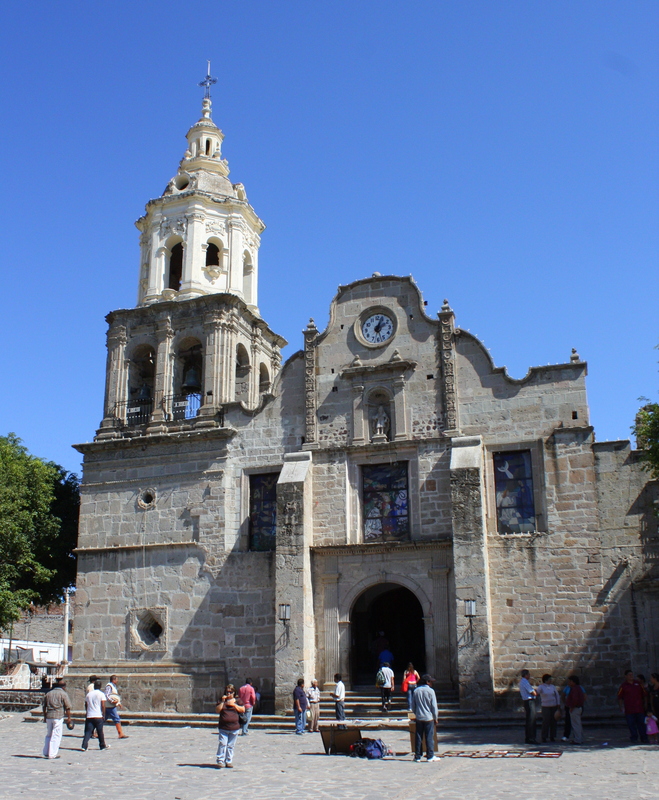 The Jesuits who arrived on the heels of the Spanish conquistadors in the 1500’s assigned a Catholic patron saint to each Mexican village. 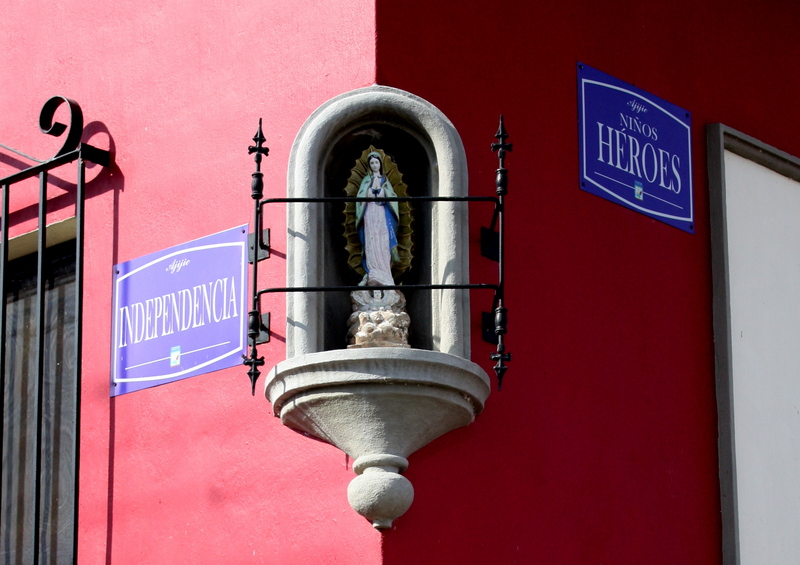 In many towns, the name of the patron saint has been tacked onto the native city name. In the village of Ajijic along the shores of Mexico’s Lake Chapala, the saint is San Andrés (St. Andrew) the patron of fishermen. The historic name of this village is San Andrés de Axixic, but most everyone here knows it simply as Ajijic. 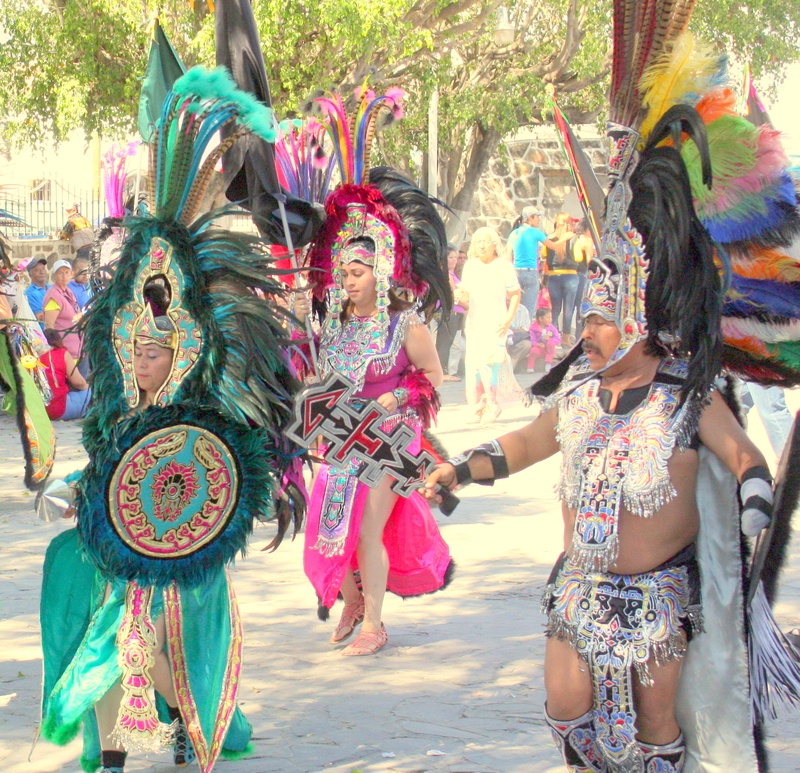 This year, the ten-day fiesta patronal – the patron saint festival – begins on Friday, November 21. 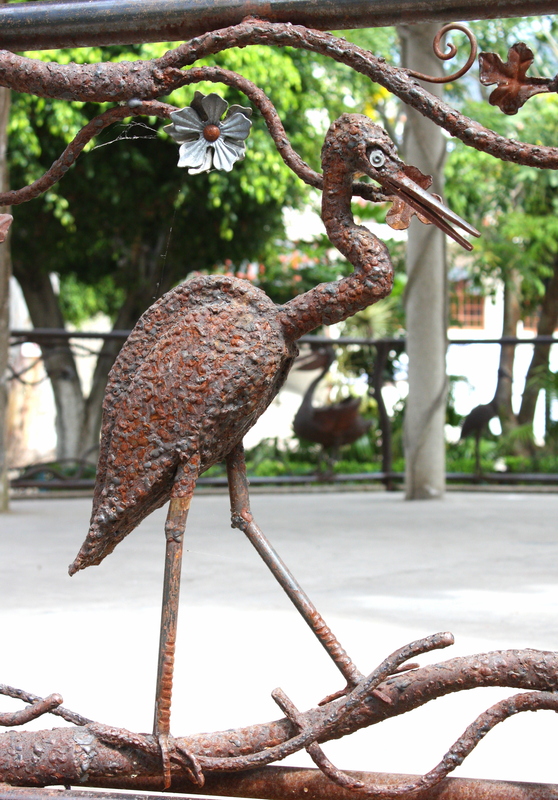 Metal sculpture on Plaza gazebo railing, Ajijic, Jalisco. 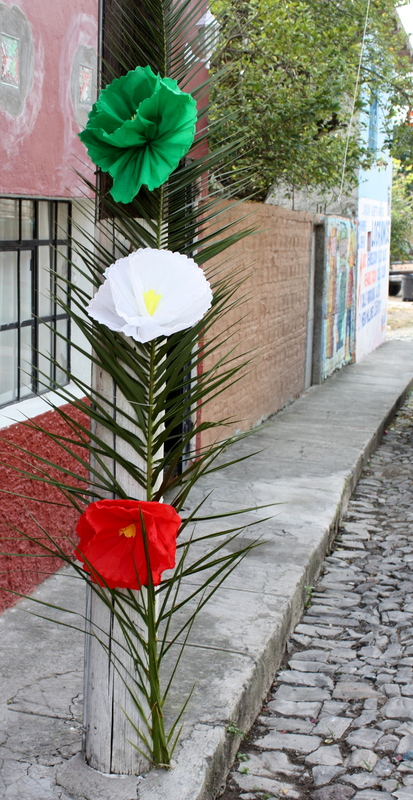 It arrives on the heels of the Dia de la Revolucion holiday, and anticipates holiday observances that begin two weeks after the fiesta with the Christmas posadas, and do not end until early in February with the Fiesta de la Candelaria (Candlemas). 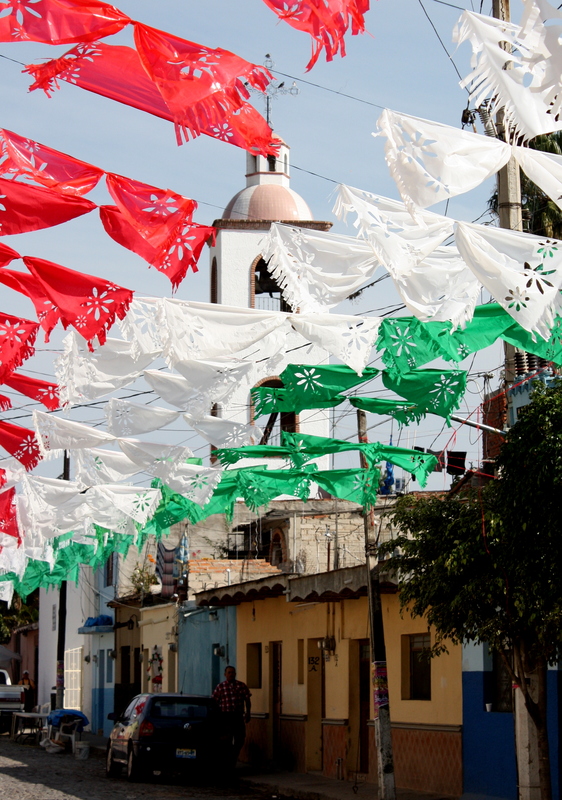 As I walk to the village plaza to see how the preparations are proceeding, only forty-eight hours remain until the start of the fiesta. 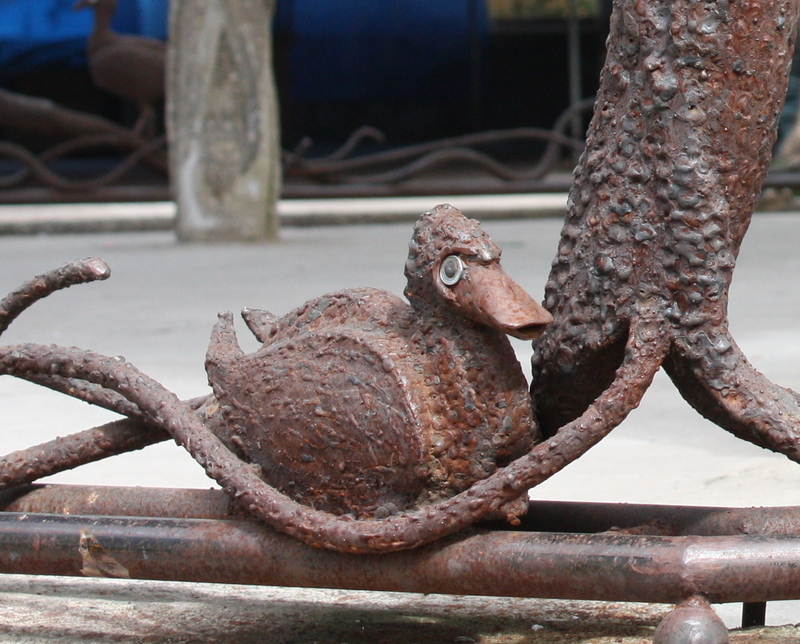 Metal sculptures of water fowl that adorn the plaza gazebo railing seem also to be looking out over the preparations. 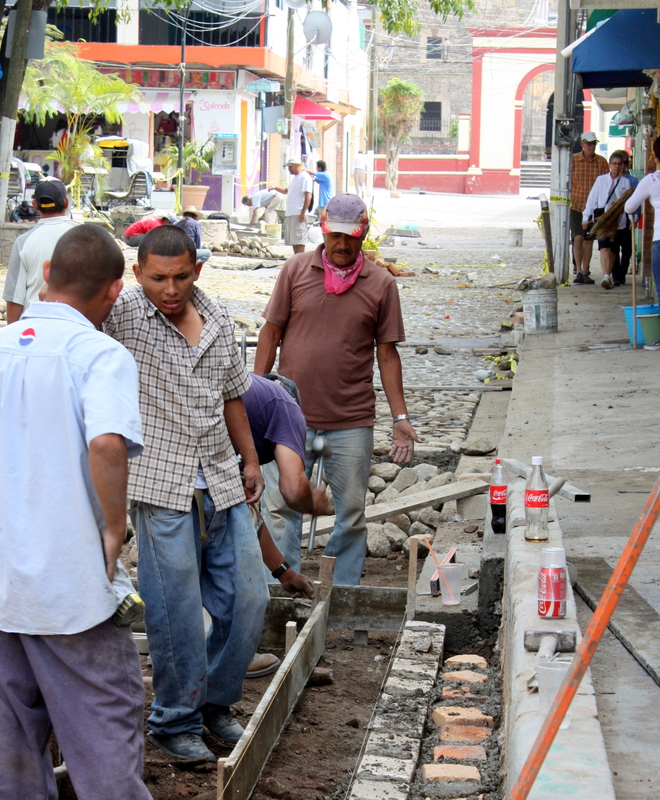 The run-up to this year’s event is marked by no small amount of suspense, because street renovations around the fiesta site, begun only weeks ago at the rainy season’s end, are still incomplete. 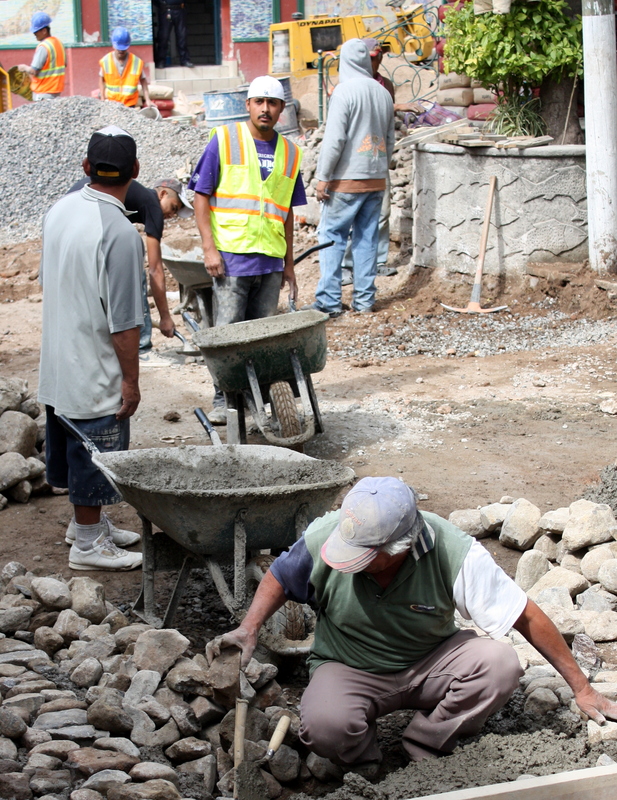 The road construction crew is working at a frenetic pace rarely seen in this part of the world. The workers setting up for the fiesta seem undeterred by the chaos. Around the plaza men are setting up canopies for booths that will sell food, beverages, and souvenirs. Under one of the canopies, a group of boys is already putting just-powered-up video games to the test. 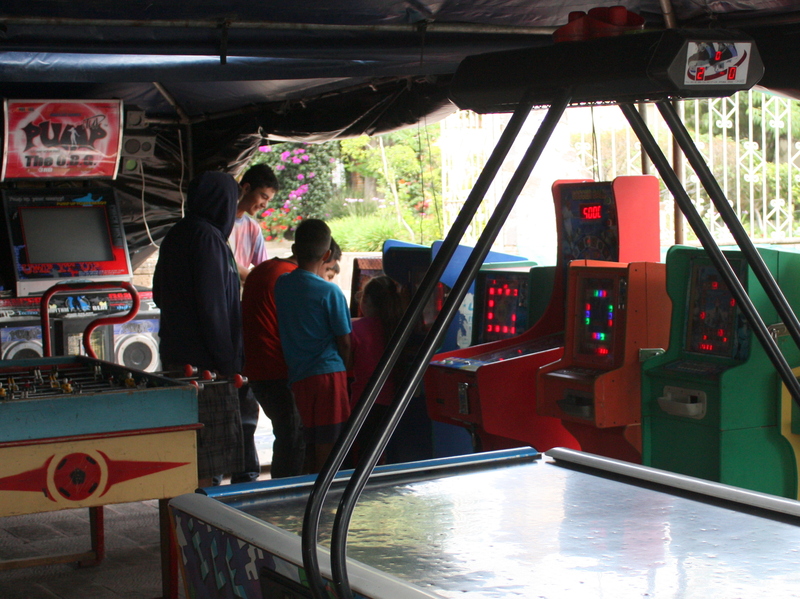 The electronic games sit side by side with an air hockey game and a foosball table! 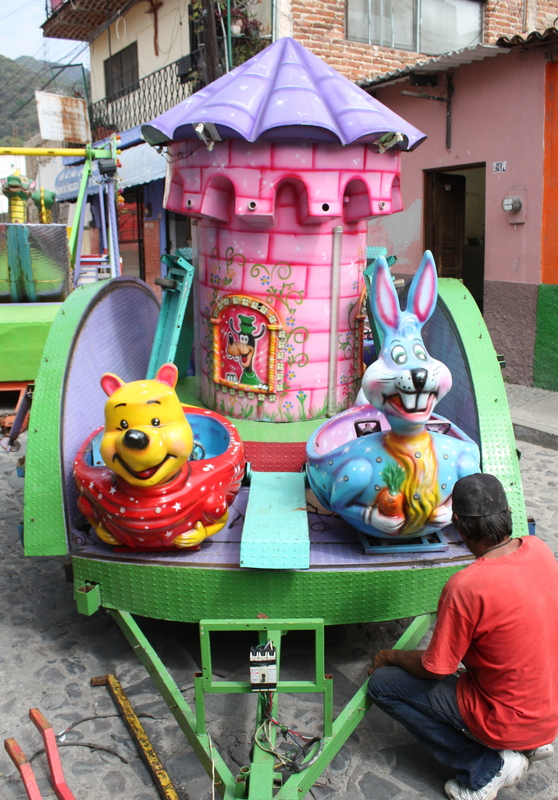 The carnival ride operators have just begun to arrive, but one ride has already been set up. 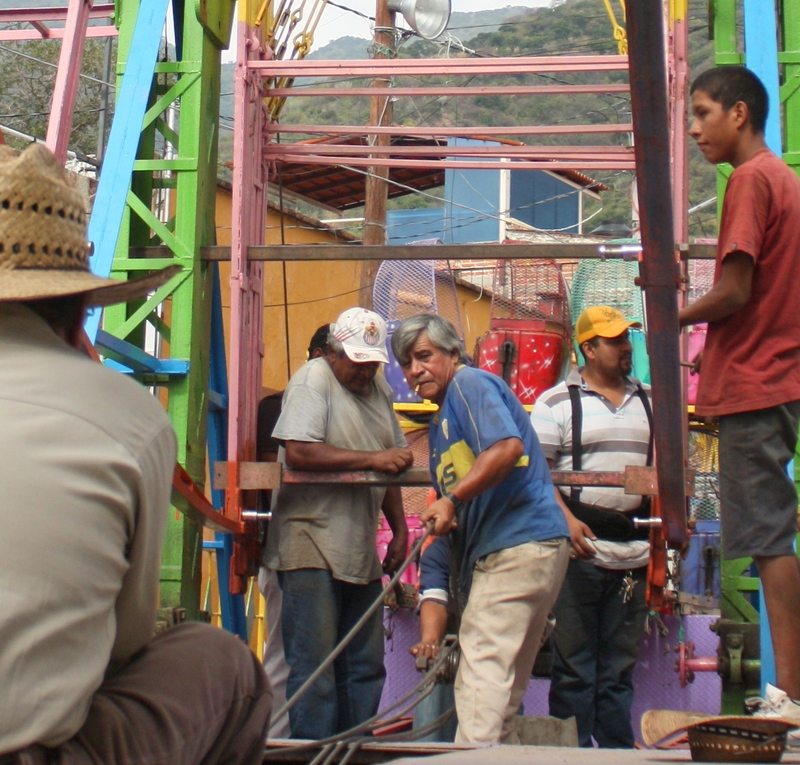 Nearby, a crew labors to erect the scaffolding of a Ferris wheel. Occupational safety is left to the workers, who seem to be largely unconcerned about it. Other rides in various states of assembly now fill the Calle Colón adjacent to the Plaza. 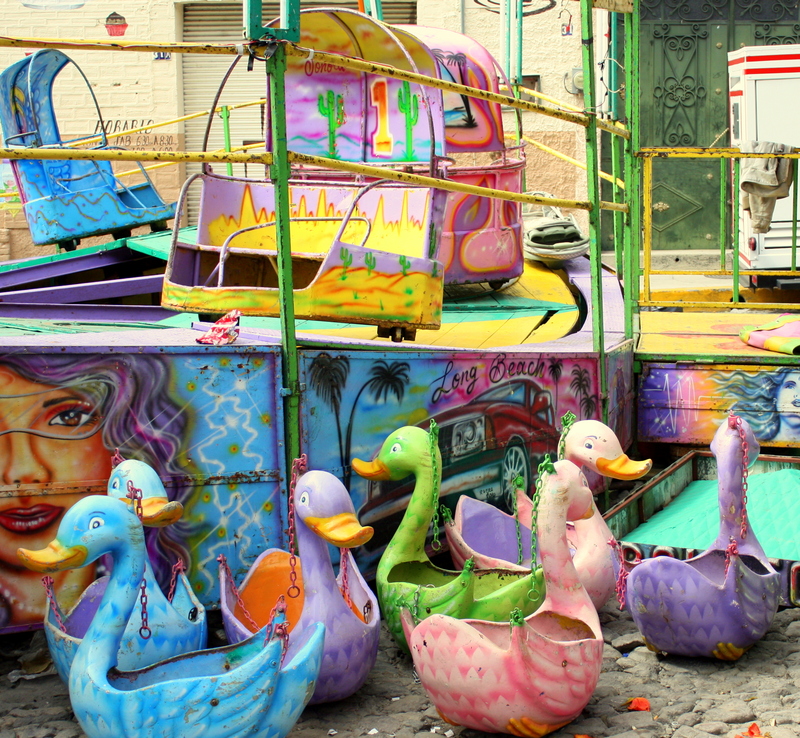 Seats decorated as fancifully painted animals are strewn around waiting to be dropped into place. 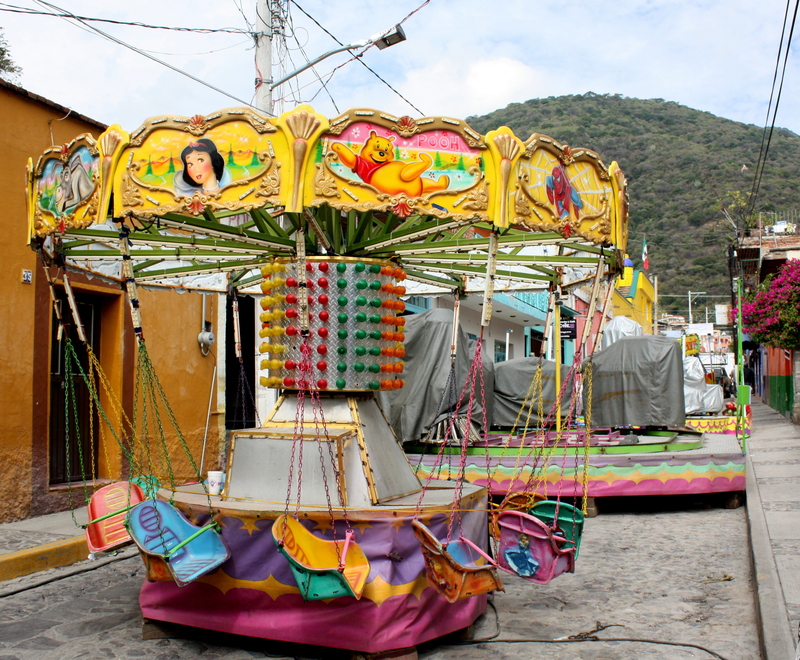 The ‘carneys’ hit the fiesta circuit at the rainy season’s end with their wives and children, often sleeping in the vehicles with which they haul their amusements from event to event. 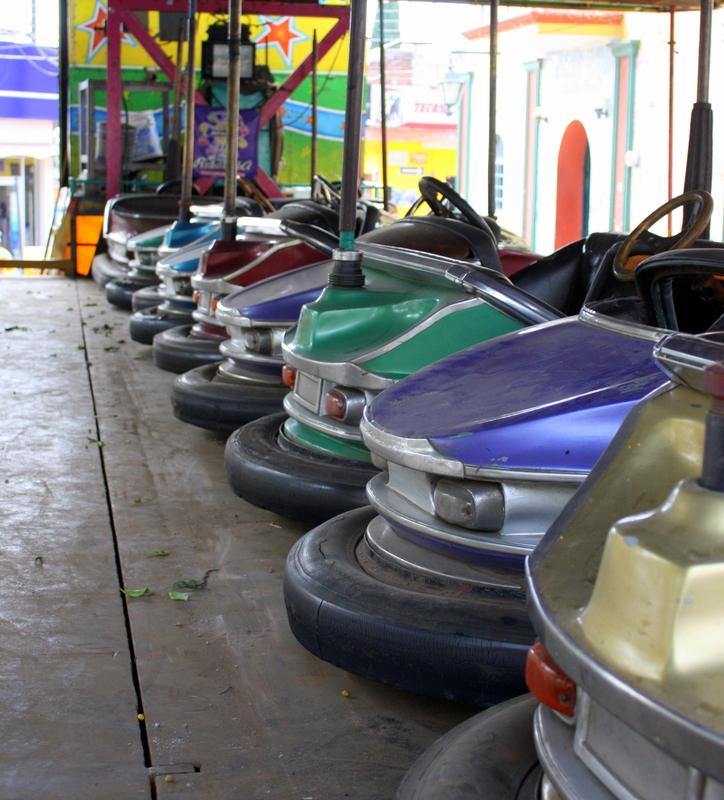 During the fiesta, it’s not unusual to see them keep their equipment secure by sleeping in the seats of their rides. 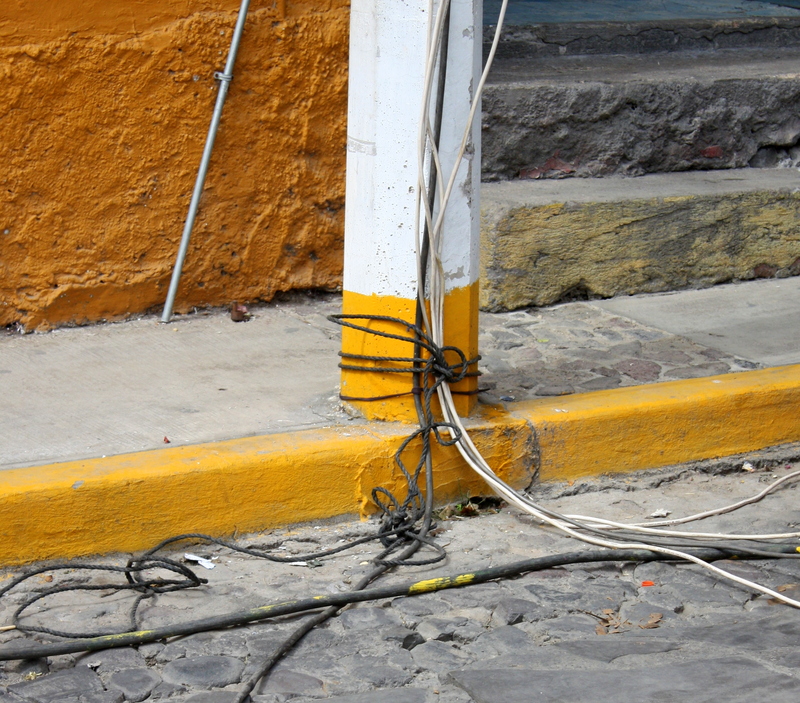 The ride operators, as always, tap directly into power lines, and a tangle of wires has already begun to form on the cobblestones. There’s not a electric meter in sight. Any fire marshal would close this party down in a heartbeat, but here the set-up has gone unchallenged year in and year out. The fiesta may be a work in progress as I walk the site, but atmosphere already feels like a nostalgic throwback to days long gone north of the border. There is no exotic, high-tech equipment here, and most of these rides would look completely at home in a 1940’s amusement park. This event, though, is far less about the carnival amusements, and much more about an opportunity for the people of the village to reaffirm their sense of community. In forty-eight hours, as dusk fades, the rides will crank up and fluorescent lights in dayglo colors will begin spinning. 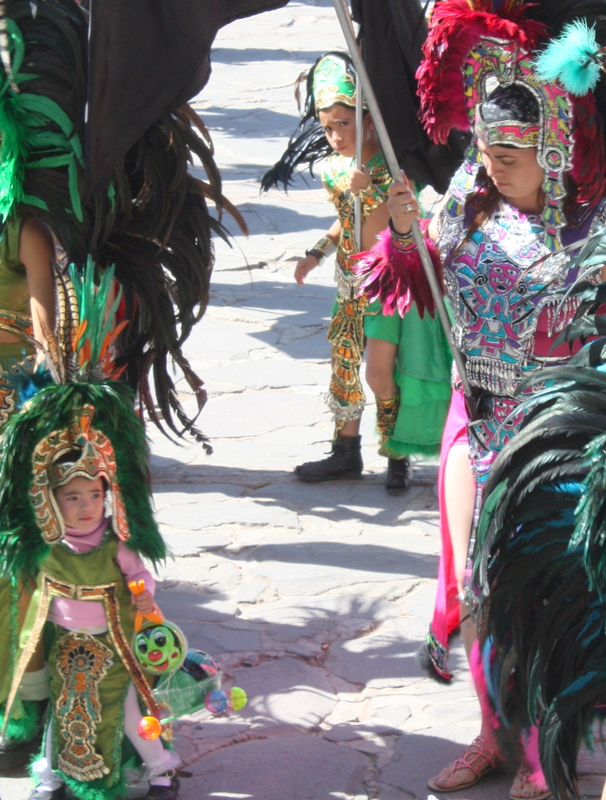 Children, their parents, and their grandparents will make their way to the Plaza to mark the passage of another year. 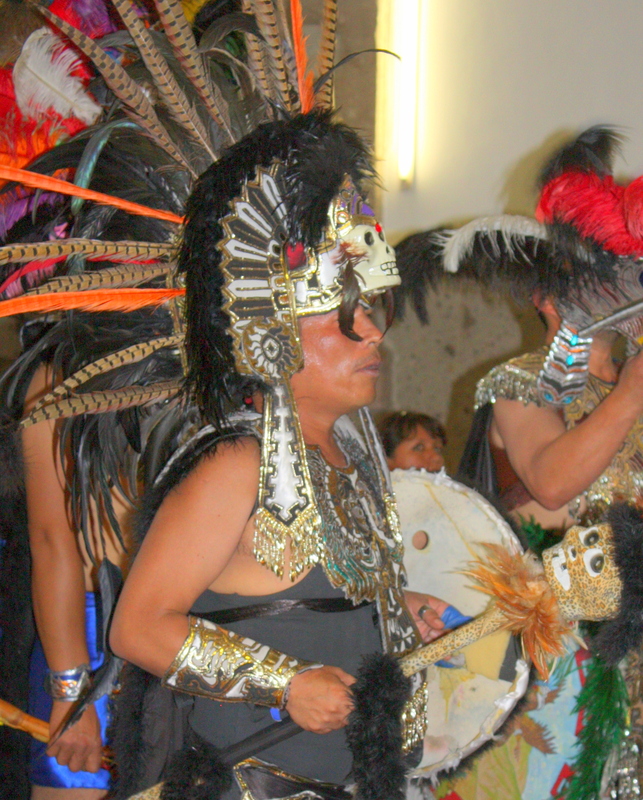 Elaborately costumed bands will pump out ear-splitting tunes until the wee hours of the morning, street vendors will hawk roasted ears of corn and other delectable curbside noshes, and ice cream sales will be brisk. If you’re unable to experience this event in person, drop by these pages in the next few days for more on the festivities. 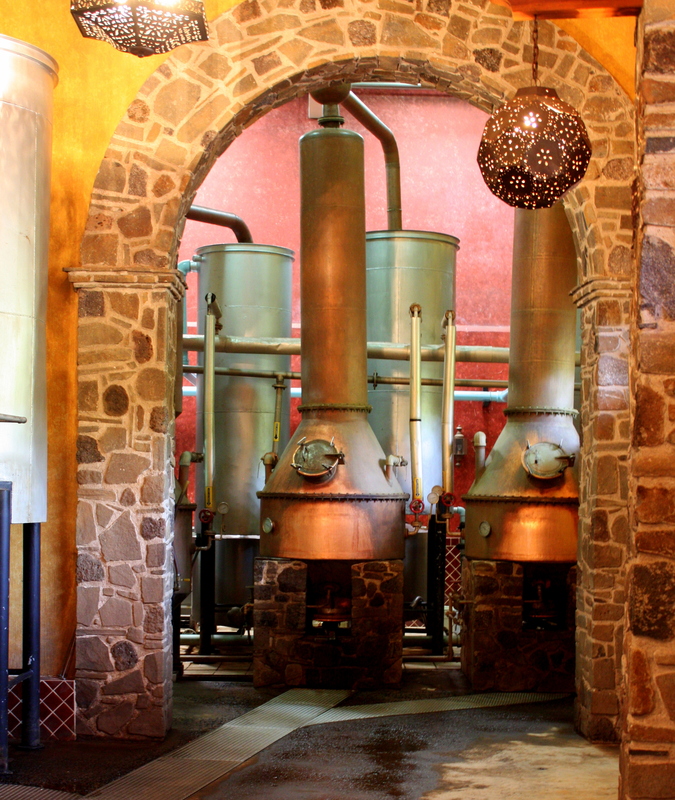 The Siete Leguas tequila distillery is located in Atotonilco El Alto, about two hours’ drive east of Guadalajara, and this family-owned distillery drips with tradition and pride. Although most well-known tequila brands are now owned by multinational corporations, more than 100 distilleries still make nearly 1,000 brands of tequila, ranging from including boutique brands and others available only domestically. 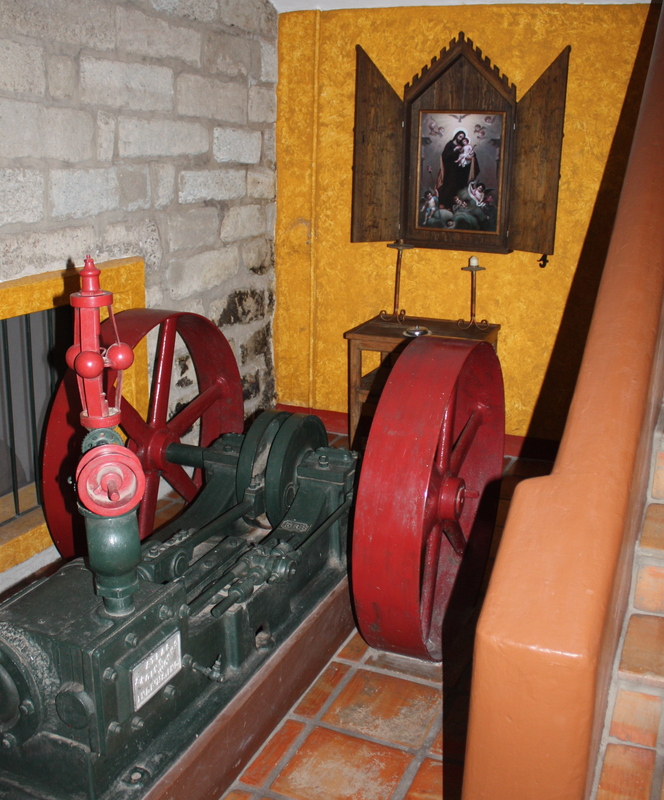 Tequila has a long history. 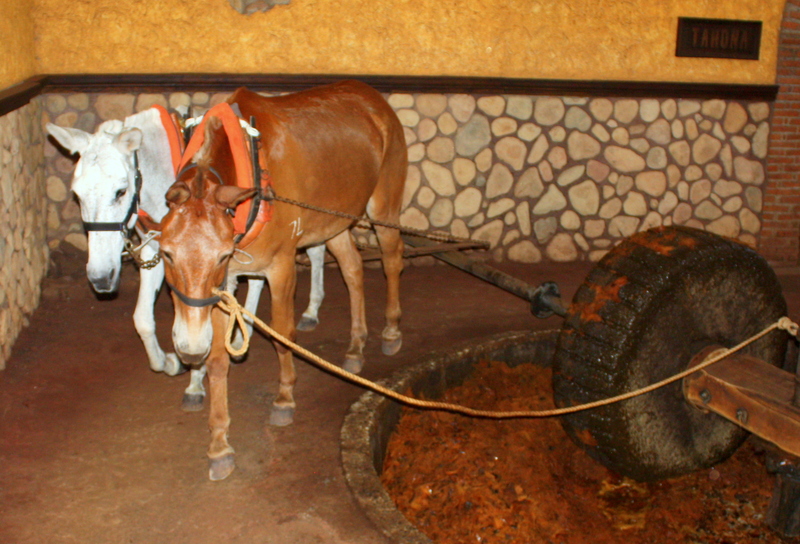 The Aztecs fermented beverage called pulque from the agave plant long before the Spanish arrived, and when the conquistadors ran out of brandy they began to distill agave. Today’s tequilas are typically 75-80 proof. By law, tequila can only be produced only in the state of Jalisco, where it’s so popular that it often accounts for half of liquor store shelf space. Just as with wines, regulators police tequila’s Appellation of Origin label to assure the purity of the product. More than 300 million plants are harvested in Jalisco each year, and also as with wine, terroir is critically important. Agaves from the highlands are larger and have a sweeter aroma and taste than lowland agaves, which have a slightly herbal fragrance and flavor. Plants grown in the highlands typically yield sweeter and fruitier-tasting tequila, while lowland agaves produce tequilas with an earthier flavor. 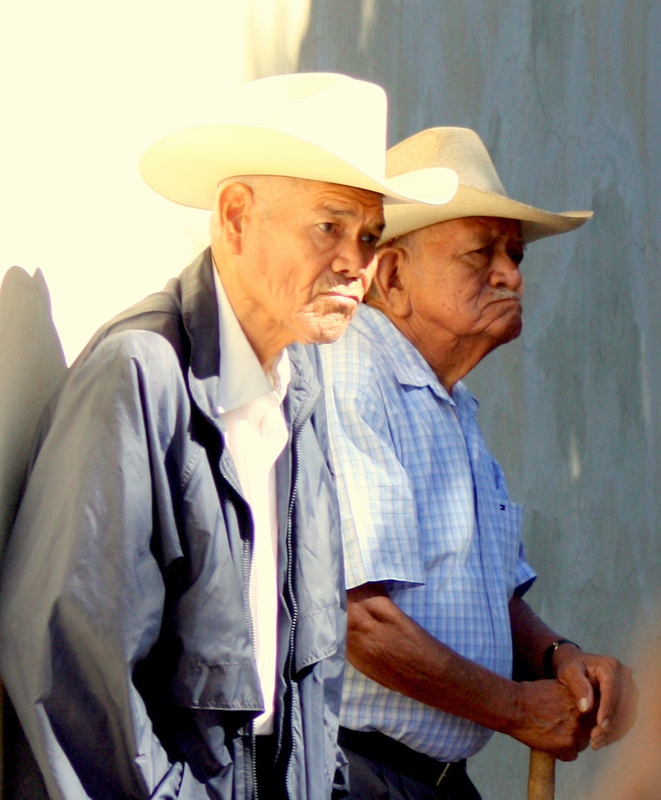 Planting, tending, and harvesting the agave plant remains a manual effort that relies upon know-how passed on through generations of the jimadores who harvest it. Ripening of the plant is promoted by regular trimming of the stalk which grows from the center, which prevents it from flowering. 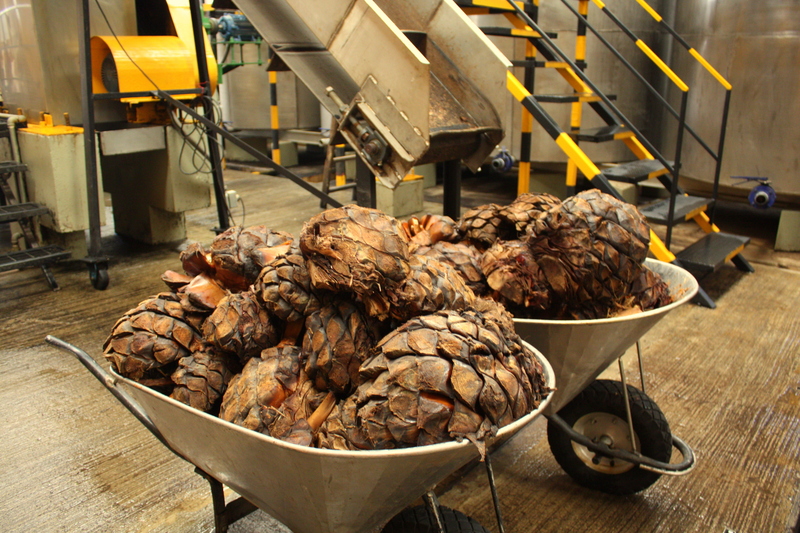 When plant is ready to harvest, jimadores trim away the leaves to reveal the pineapple-like core of the plant – the piña, which can weigh up to 250 pounds. 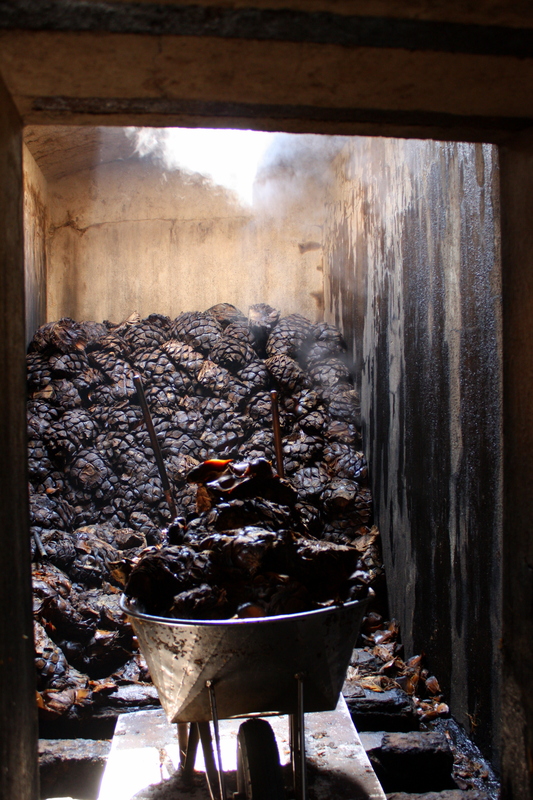 Once harvested, piñas are oven-baked to break complex starches down into simple sugars before shredding or mashing. 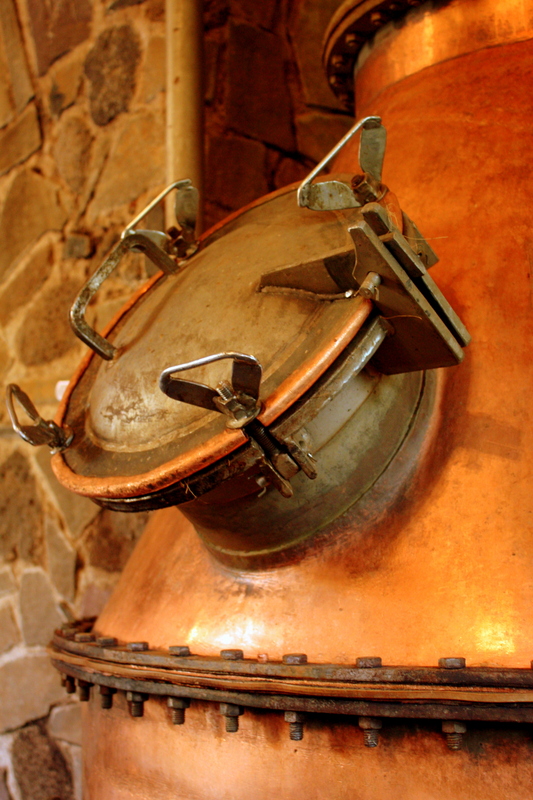 Extracted agave juice ferments for several days in large vats to produce a low-alcohol wort, which when twice-distilled produces silver tequila. 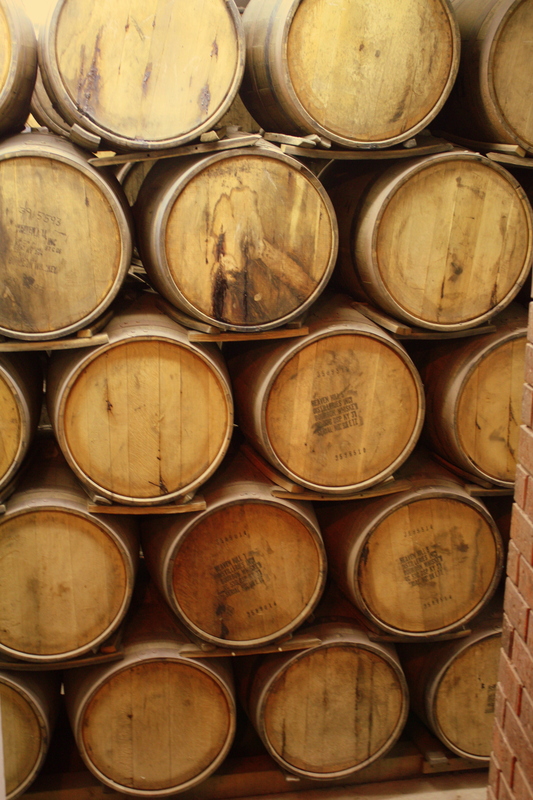 Some tequilas are aged in wooden barrels to mellow the taste and lend color. 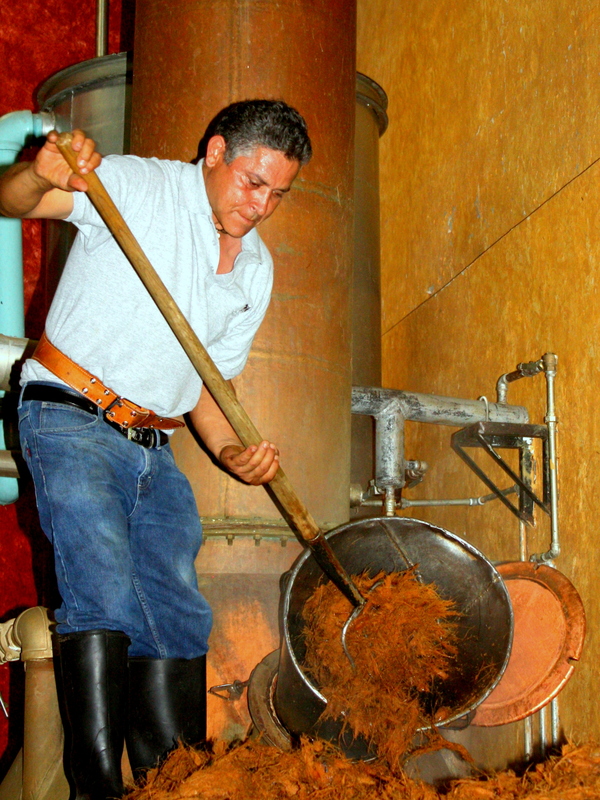 In recent years, regulators allowed the creation of a new tequila category called “extra añejo,” which must be aged a minimum of three years. 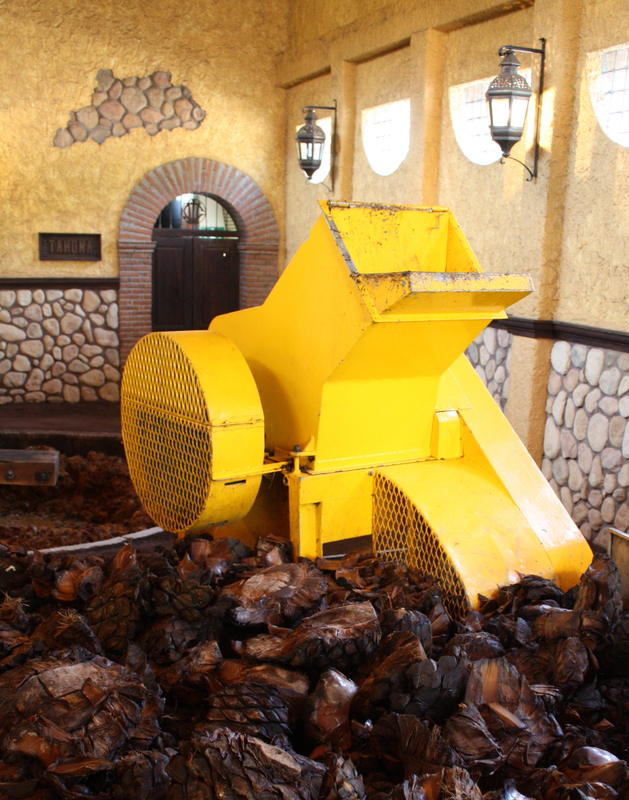 Many growers believe that increasingly hot and dry summers resulting from calentamiento – global warming – are causing agave to mature more quickly, at the expense of sugar content. 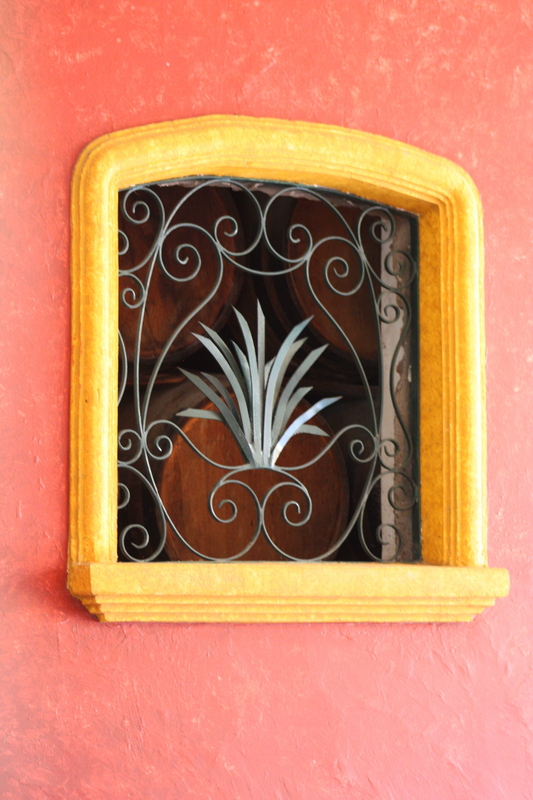 It typically takes eight to twelve years before an agave plant is ready to harvest. Now it’s on to the tasting! 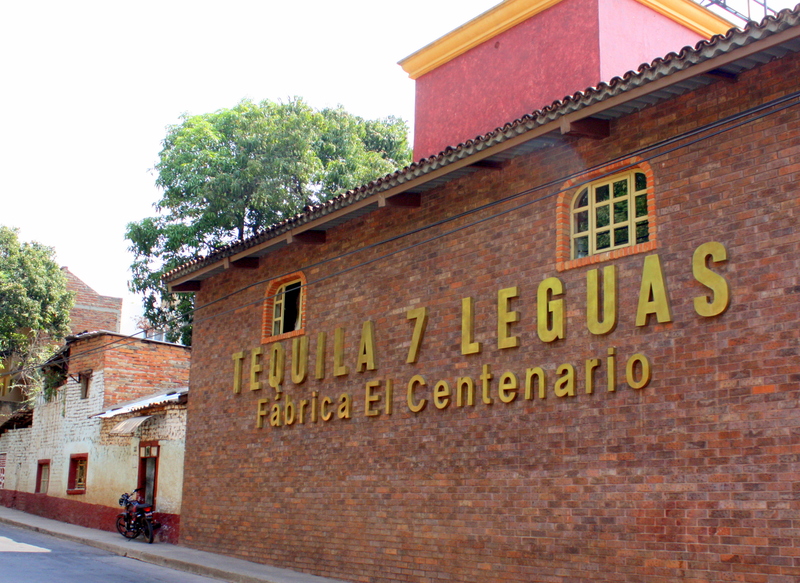 Note: While 7 Leguas maintains an office within the city, the distillery is located on the outskirts of town nearer to the agave fields. Visit the web site here. 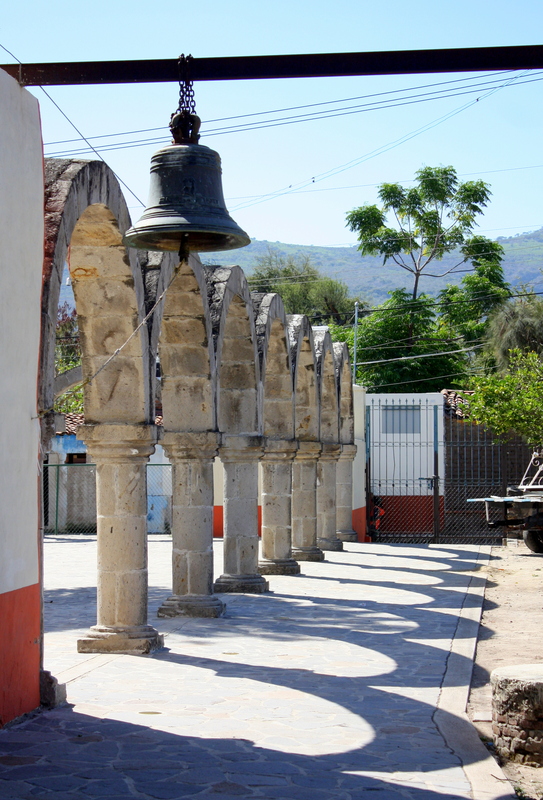 The Jalisco villages of Cajititlan and San Juan Evangelista face each other across a couple of kilometers of lake, but on the day of my visit they’re also separated by 300 years of Mexican history. 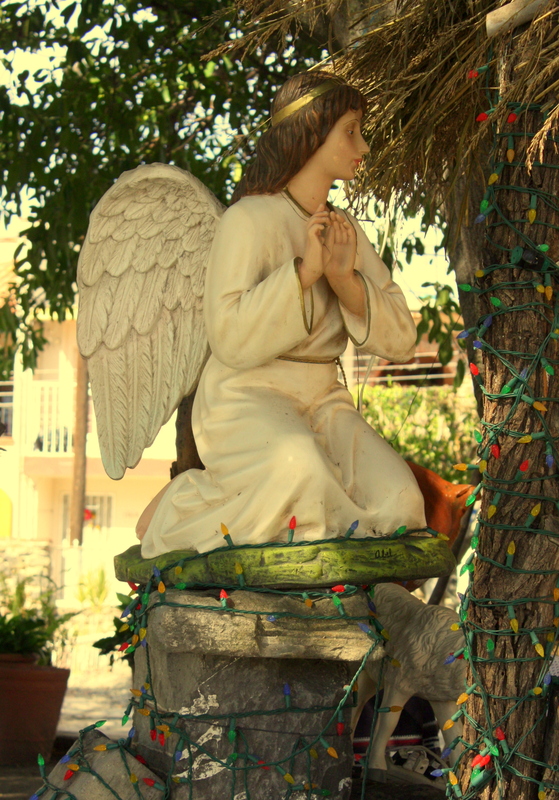 I can’t take credit for planning this trip to Cajititlan on the Día de la Candelaria (Candlemas) but – as these photos show – the timing couldn’t have been more fortuitous. Candlemas observes the Biblical presentation of the infant Jesus at the temple in Jerusalem 40 days after his birth, but here it’s also the last observance of the Christmas holiday season. 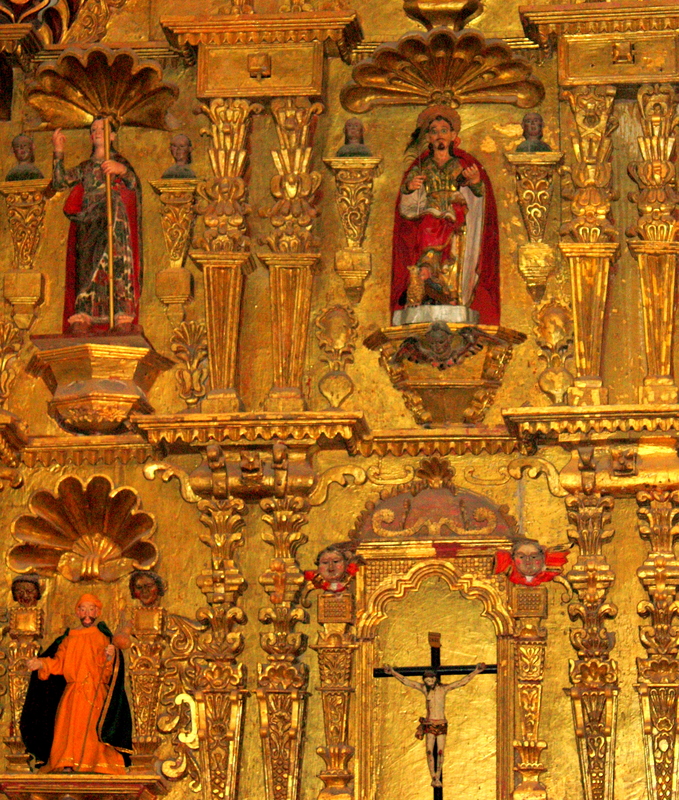 Figures of the baby Jesus first displayed in Nativity scenes on Christmas Eve are given presents from the Magi on el Día de los Reyes (King’s Day, January 6). 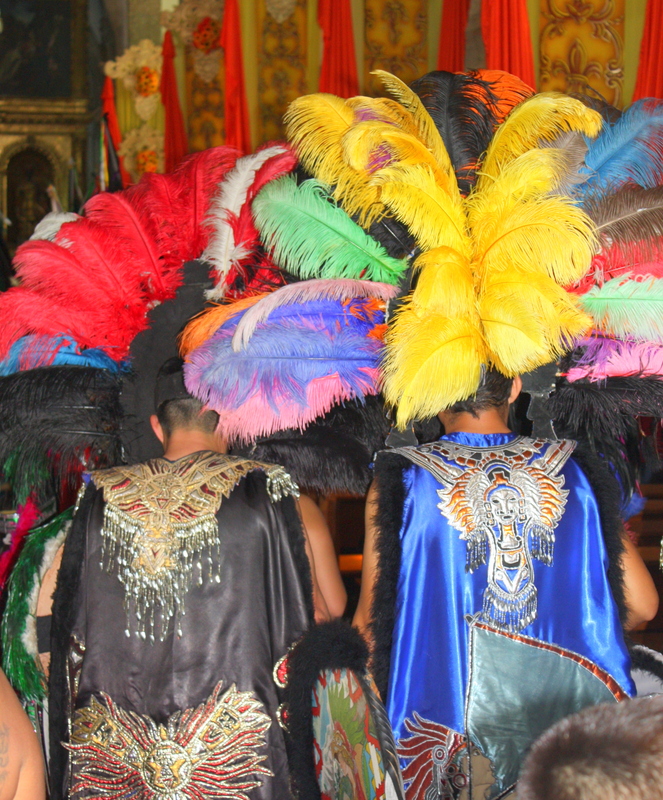 On the Día de la Candelaria (February 2) they’re dressed in fine clothes and presented at the church for blessing. Family and friends also traditionally gather on this day to eat tamales. 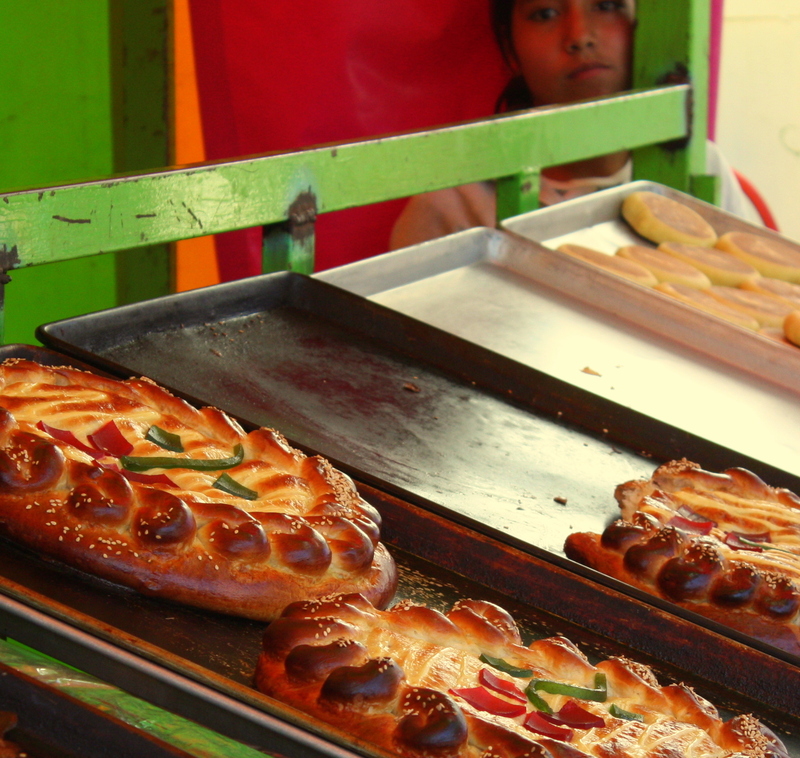 In Mexico, this holiday is a follow-on to Kings’ Day, when children receive gifts and families and friends break share generous loaves of Rosca de Reyes, a special sweet bread with a figurine hidden inside. 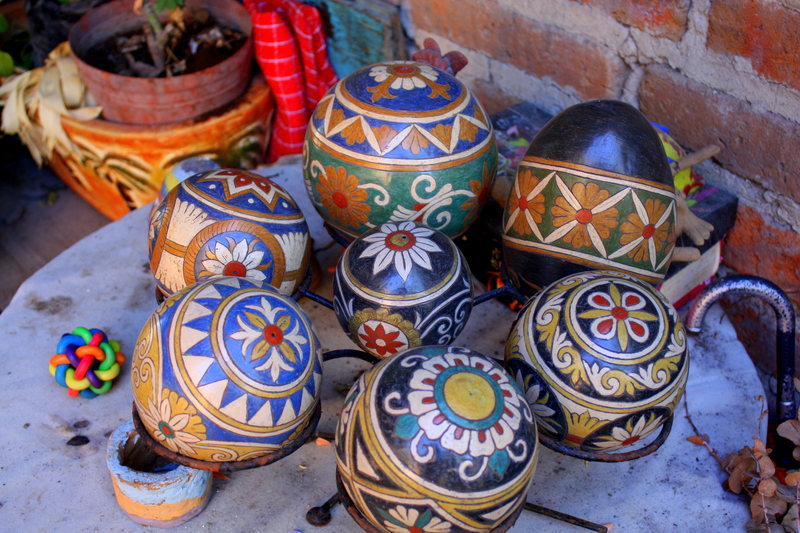 Whoever finds the figurines in their portion must host a party on the Día de la Candelaria. We arrive in Cajititlan to find streets jammed with cars that surround blocks of the city center cordoned off for a great street festival. 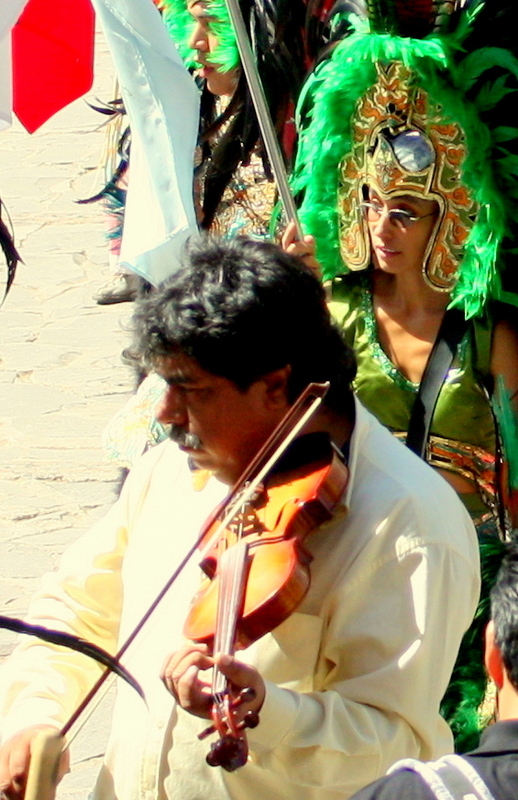 On the approach to the central plaza and the local parish church, the sound of drumbeats grows ever louder. 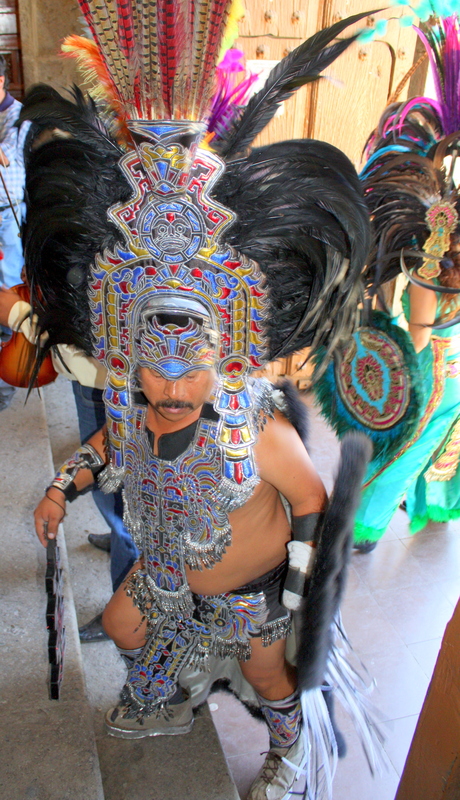 The narrow street opens suddenly onto the plaza, where at least 40 dancers in full Aztec ceremonial garb move about in intricately choreographed lines. The costumes are elaborate and the pageantry is stunning. 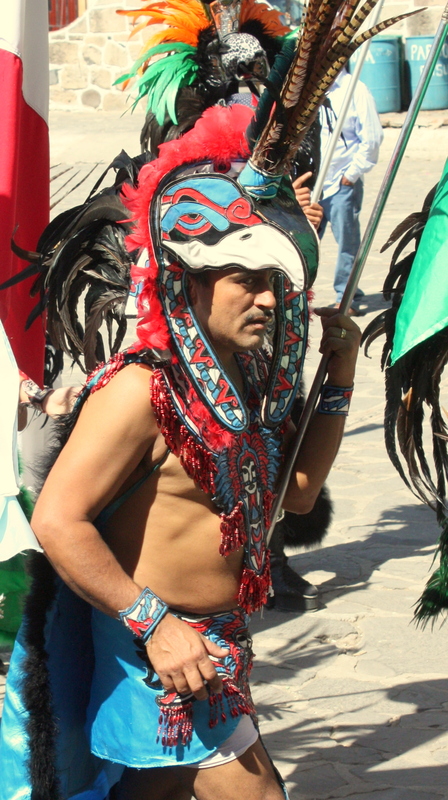 The dancers are men and women of all ages, and even a few children participate. As I draw closer I can hear faint strains of a violin, and in a moment see a fiddler walking among the dancers, an impresario guiding the procession toward the church. The church is packed as the procession makes its way up the central aisle toward the altar, the drums continuing their steady beat. It’s startling to see this spectacle of pagan-rooted pageantry occupy a place of Christian worship. As as the ceremony ends and the procession backs slowly down the aisle and back into the sun-washed plaza, though, its leader makes the sign of the cross and kisses his fingers. I study the dancers more closely, and can see crosses hanging around the necks of many. 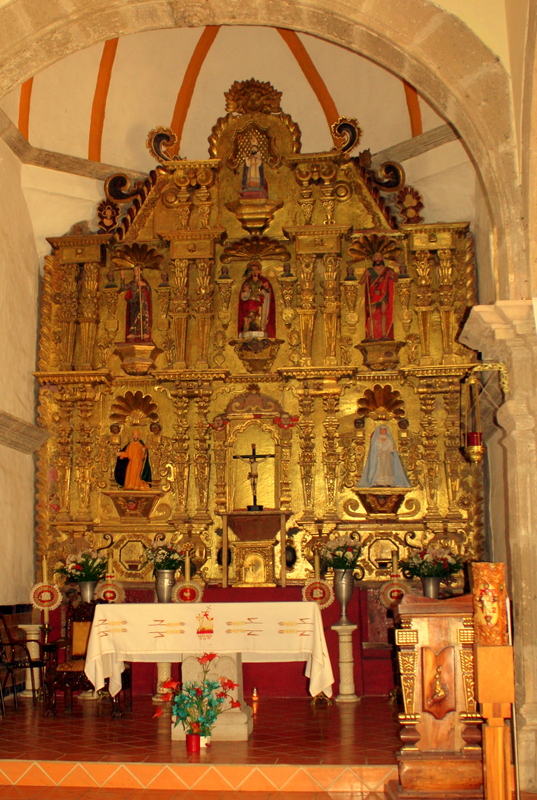 Nearly 500 years after the Conquest, and 400 years after native artisans surreptitiously integrated icons of their native religion into the design of the church in nearby San Juan Evangelista, native tradition has re-emerged as such an integral part of mainstream Catholic ceremony in Mexico that it’s no longer possible to imagine one without the other. Things have, indeed come full circle. 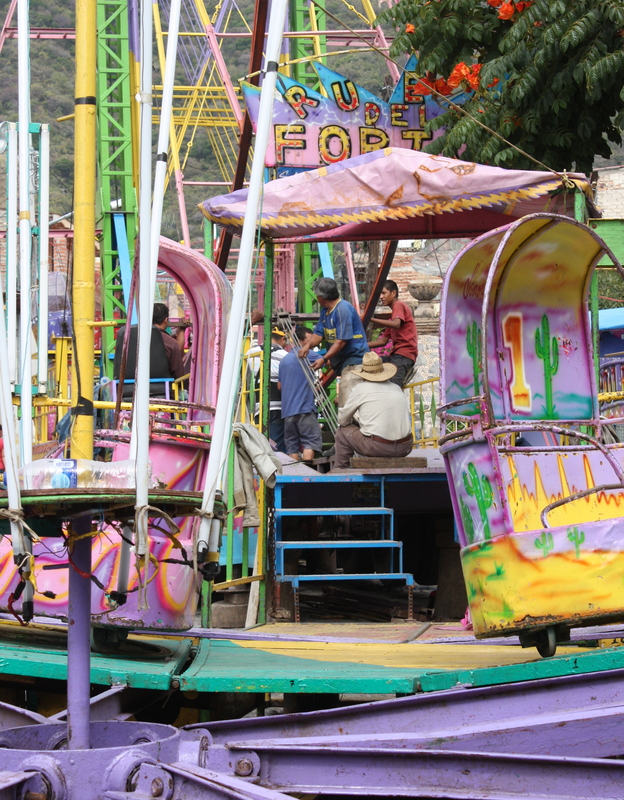 No less than for county fairs north of the border there’s both a sameness to Mexican village fiestas and yet always some feature that uniquely ties each to a single place. 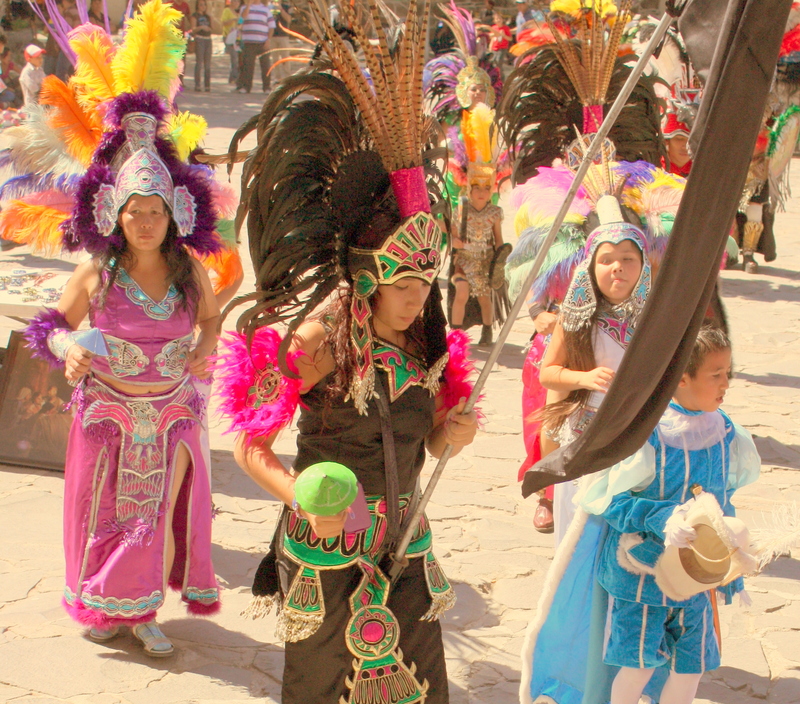 Cajititlan’s fiesta del Día de la Candelaria proves itself no exception. As the ceremony on the plaza ends we plunge into a street fair which begins at its edge, lining the curbs of a dozen or more square blocks that slope gently down to the lake. Canopied booths line both sides of the cobblestone streets and the crowd threads its way through the narrow passages between. The crowd is a mix of villagers and day-trippers from nearby Guadalajara; I seem to be the only gringo within eyesight and the sense of total immersion is a refreshing break from gringi-fied Ajijic. 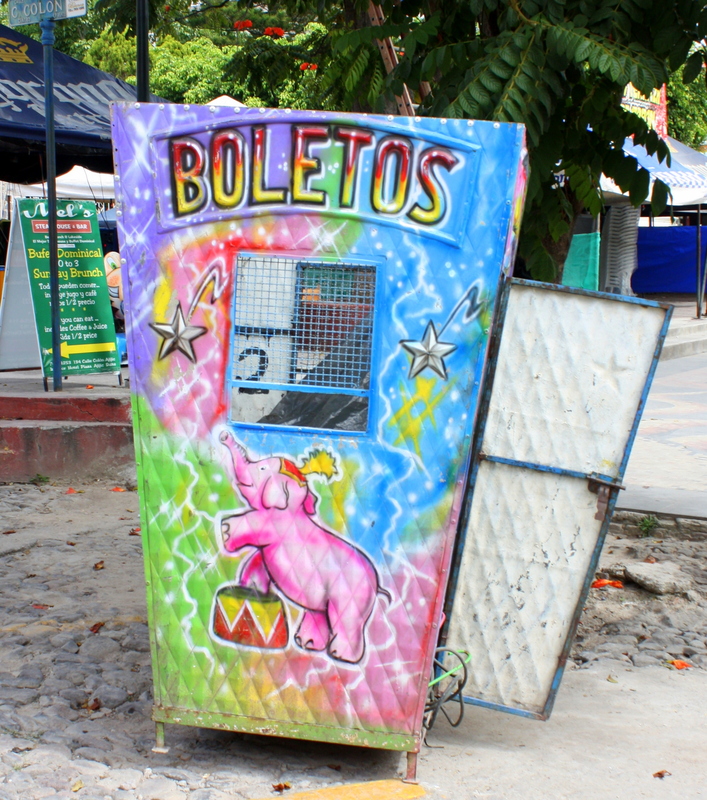 Market stalls feature the predictable mix of street food, artisan crafts, household items, bootleg CD’s and DVD’s, and clothing. 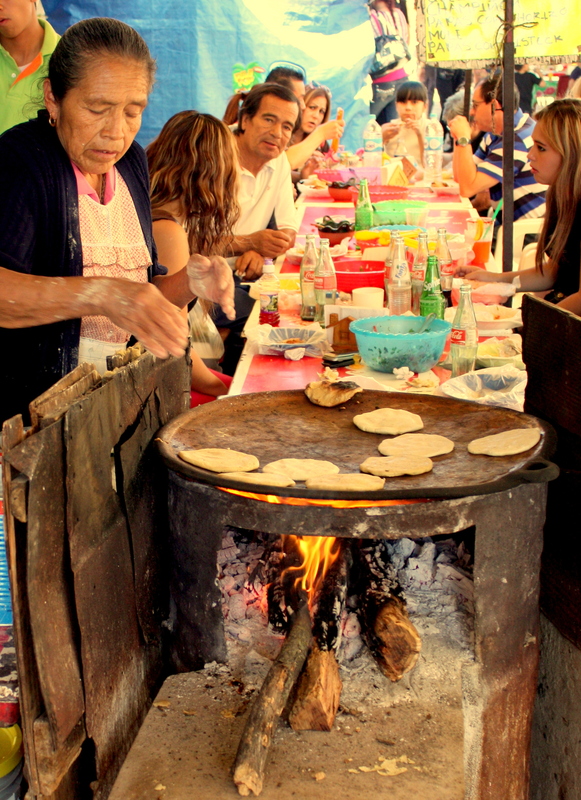 Diners sit family-style at long tables where women hand-form tortillas from masa ground on-the-spot using stone metates and grilled on clay comals over wood fires. Tacos don’t get any fresher than this! The very last of the Roscas de Reyes – the King’s Day sweet bread – sit forlorn on a baker’s rack in their final day-old sale of the year. We pass a centuries-old building that once housed a convent. It’s closed to the public on this holiday, but I make a mental note to see it on a future visit. 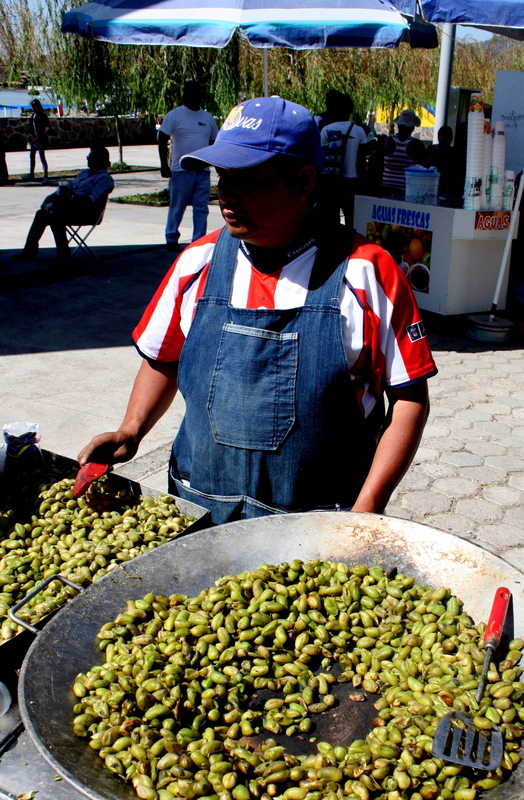 A street vendor cooks bright, unshelled garbanzo beans over a gas-fired griddle. I buy a small bag and pop the steaming beans free of their pods, eating them by handfuls. Delicious! 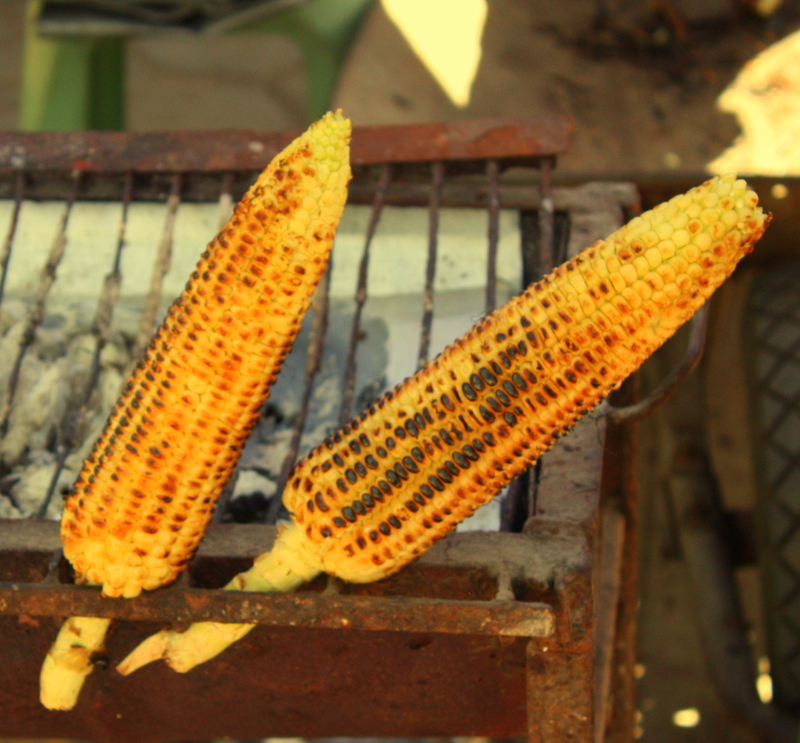 Corn roasts over glowing embers curbside. 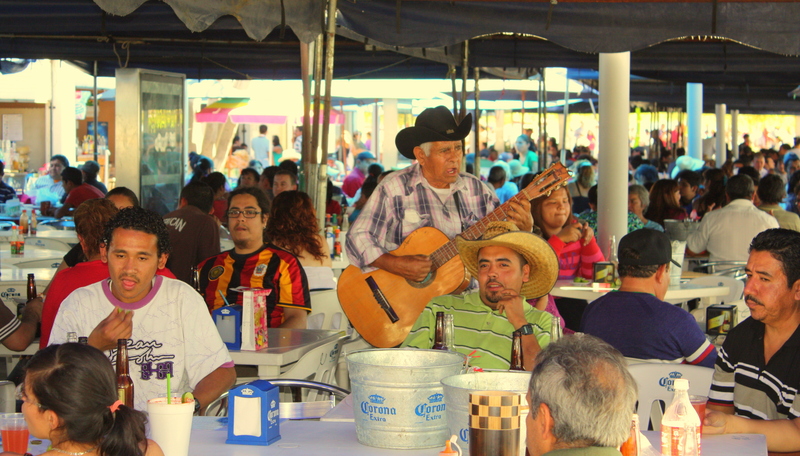 Under expansive canopies pitched in the soft breeze along the malecon at the water’s edge, a guitarist strolls among families singing ranchera as his listeners share the season’s traditional tamales. 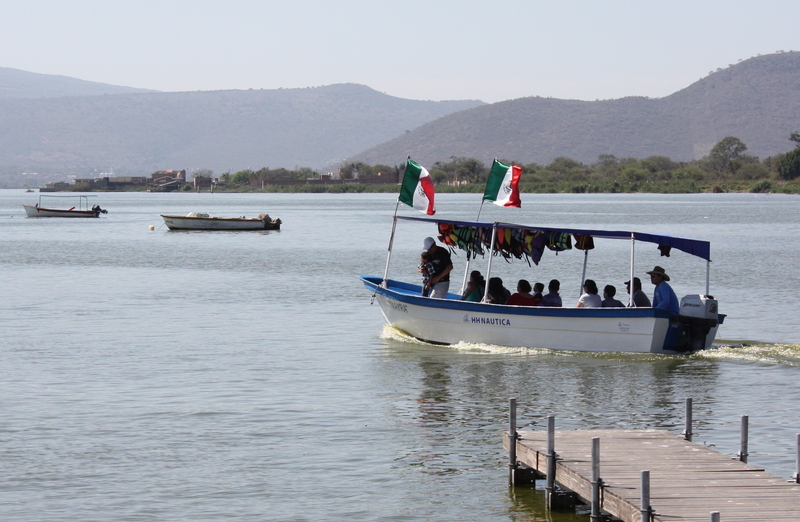 At the pier along the malecon families board small launches for leisurely cruises on the lake. Nearby a musician absently fingers the keyboard of his accordion, squeezing out tunes so often played that his fingers move unthinkingly over the buttons and keys. I can’t help but smile in satisfaction as we retrace our steps to my parked car, passing the now deserted plaza. 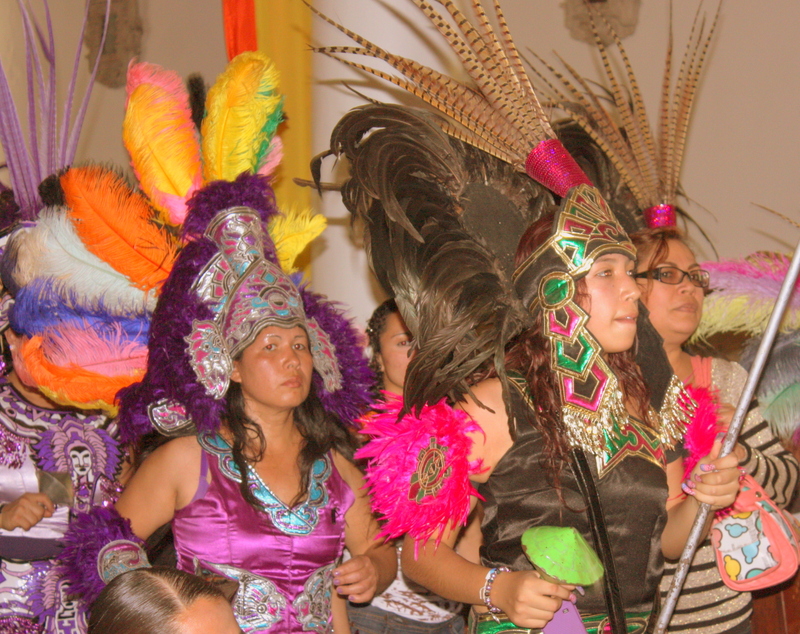 This fiesta has been a perfect ending to a perfect day spent driving the villages around Lake Cajititlan. 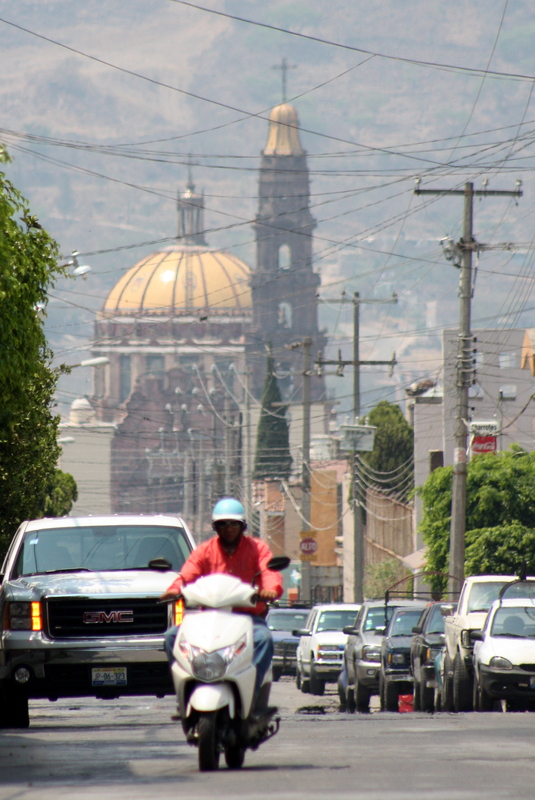 The bright lights of cosmopolitan Guadalajara are but 30 minutes’ drive away, but here in the country villages along the lake traditional Mexico is alive and well. 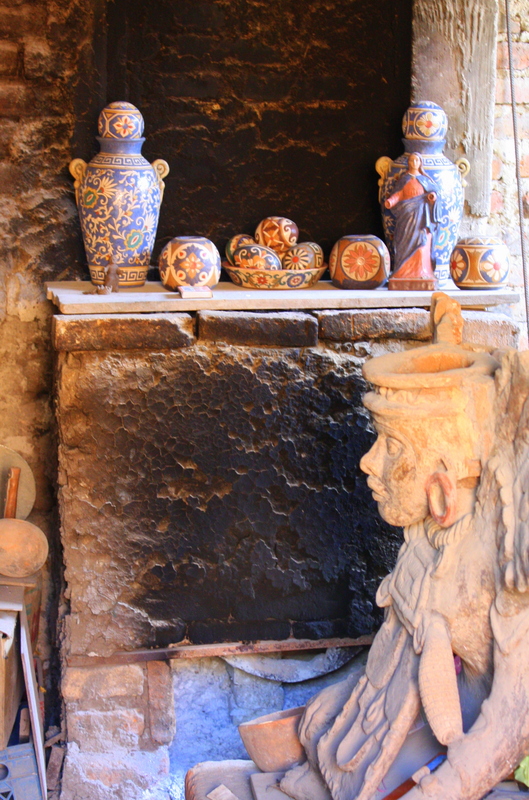 I’d have counted it a very rewarding day if it ended with my visit to the studio of barra (clay working) maestro Martín Ibarra Morales in Jalisco’s San Juan Evangelista. I turned out instead that the studio visit was but a taste of what would soon reveal itself along the shores of Lake Cajititlan. Spanish soldiers and Catholic missionaries arrived here on horseback within 50 years of Columbus’ first arrival in the New World and within 10 after Tenochtitlan (now Mexico City) fell to Cortes, pressing toward the Pacific Ocean and ever in search of more gold. From its first expansion beyond the boundaries of the Roman Empire, Catholicism has time and again promoted conversion of pagan peoples by incorporating aspects of their religions into its own imagery and rituals. In few places is its chameleon bent as widely evident as in Mexico, and nowhere in my experience as pervasively as in San Juan Evangelista. Martín guides me and my Mexican artist and friend Jesús López Vega across the street to where a church dating from the 1600’s stands adjacent to a graveyard. 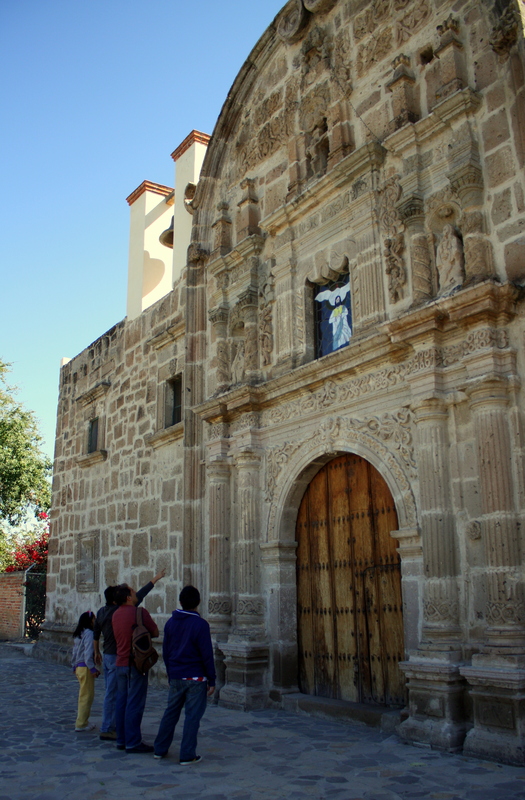 Like many buildings of the period in this part of the world, this church was constructed by indigenous craftsman under the direction of priests. 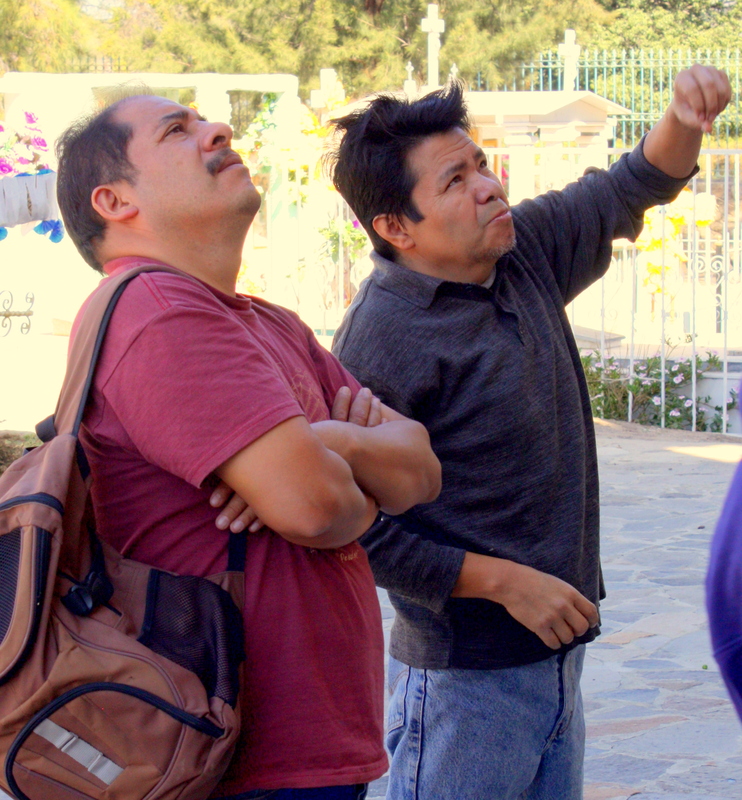 Martín explains the facade imagery to Jesús. 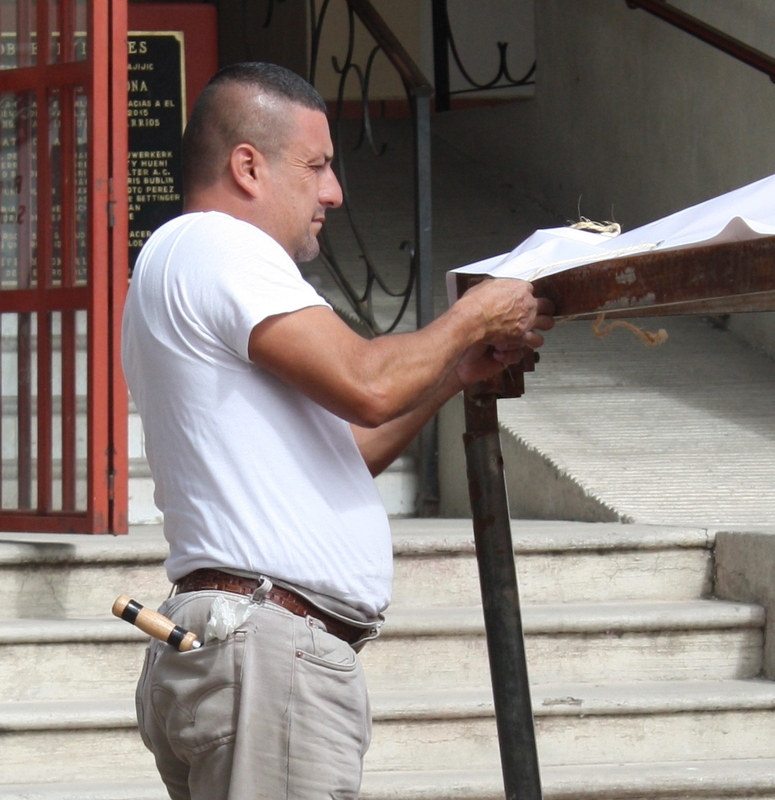 To the untrained eye it looks like many Spanish Catholic churches, but Martin knows better and he shares his insights as he points out features of the building’s architectural detail. It becomes quickly apparent that things are not what they first might seem. If the priests believed that ministrations backed by Spanish arms would quickly and irrevocably convert native peoples to Christianity, they were indulging far more in wishful thinking than they were ever to know. Hidden within the elaborate stone façade are icons of the native religion, speaking in seditious code to a people conquered, but undefeated. 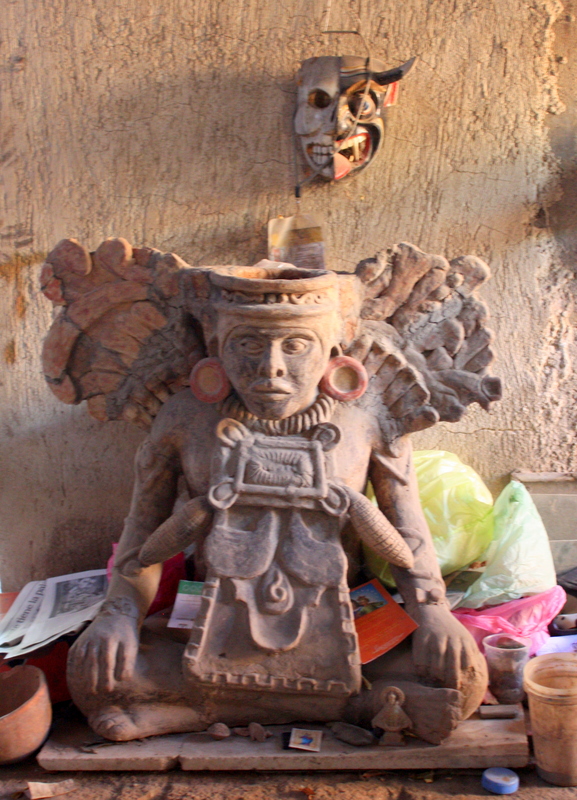 In Christian tradition the serpent is a personification of the Devil, but in native religion the plumed serpent is a deity that archeologists say first appeared in Mexico about the time that Christ was born. 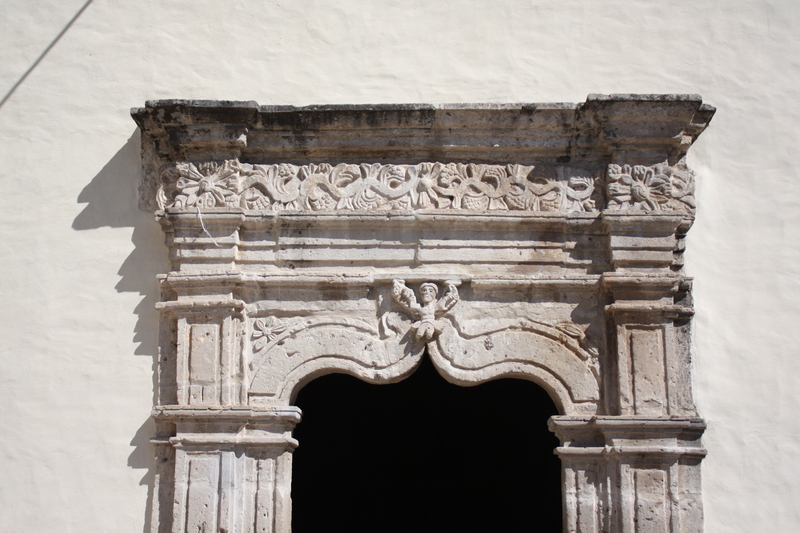 Soon the artist in Martín can resist no longer and he stoops to reproduce the façade’s scrollwork in the dust, showing how its unusual double-scroll pattern is actually a serpent. 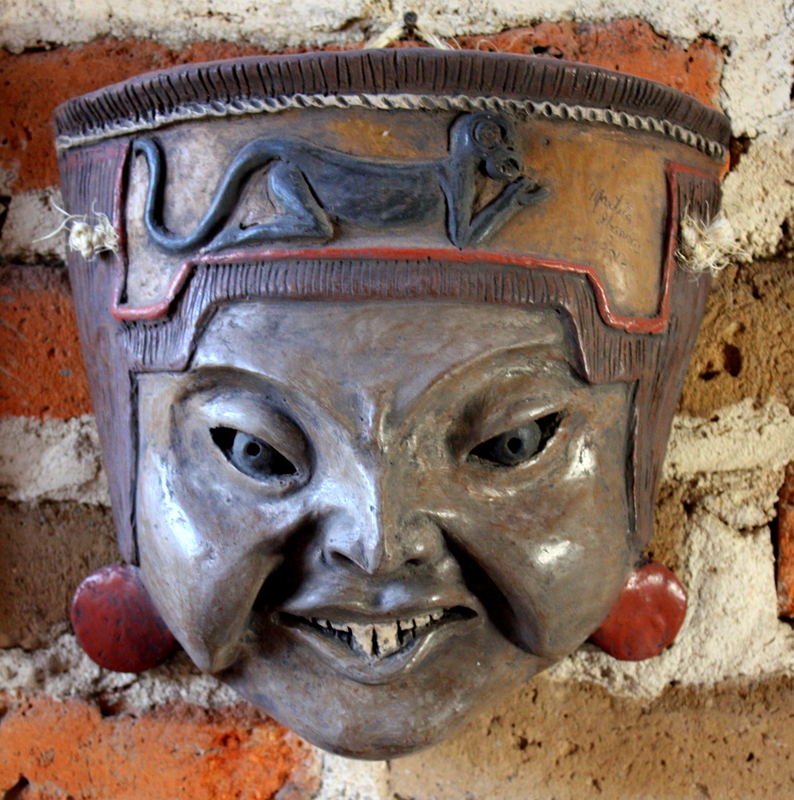 Feline faces that adorn drain spouts just below the roof line high above are decidedly un-Christian images of jaguars. 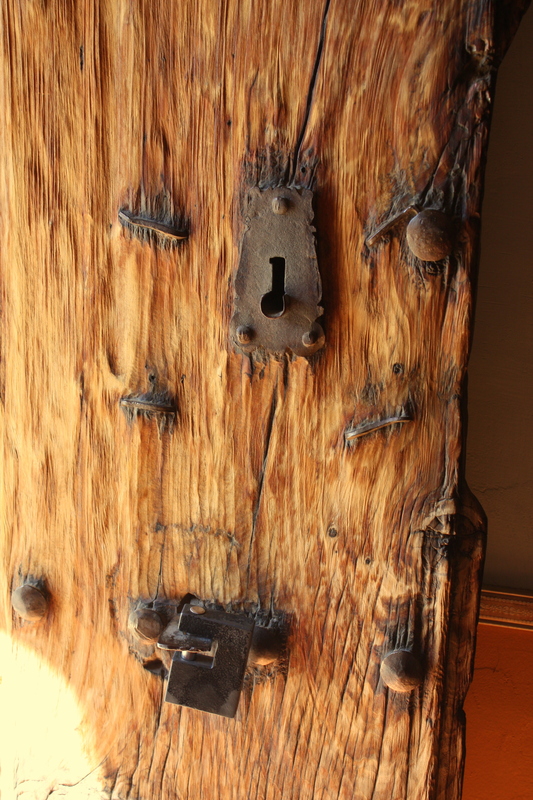 We enter the church through a side door that shows every sign of being part of the original construction, its edge worn smooth by worshipers’ hands over the course of more than 300 years. 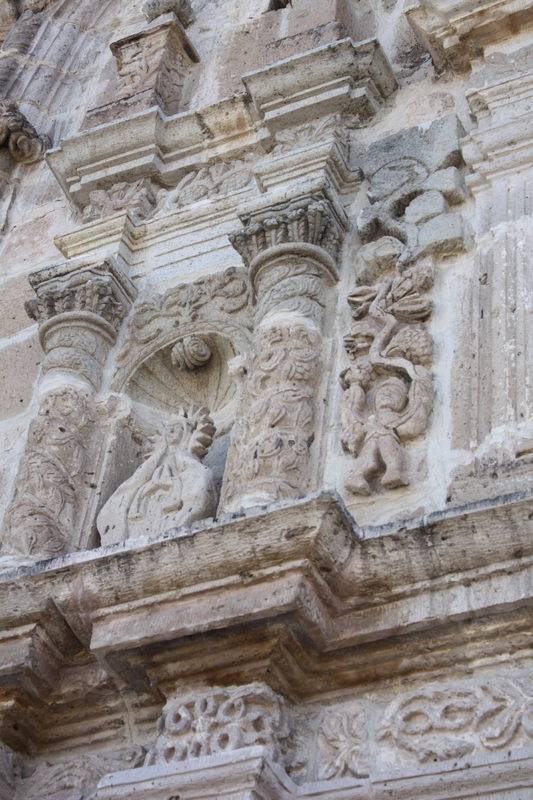 Inside, Martín points out more indigenous icons hidden within the three-story-high carved imagery behind the altar, and in designs of carved cantera stone above the doorways. He recounts a story long told in his village that priests discovered – years after completion of the construction – that the native workers had hollowed out statues of saints which adorn the interior, and placed within their hollowed spaces images of their native gods. It’s a remarkable demonstration of faith and passive resistance that can’t help but inspire. 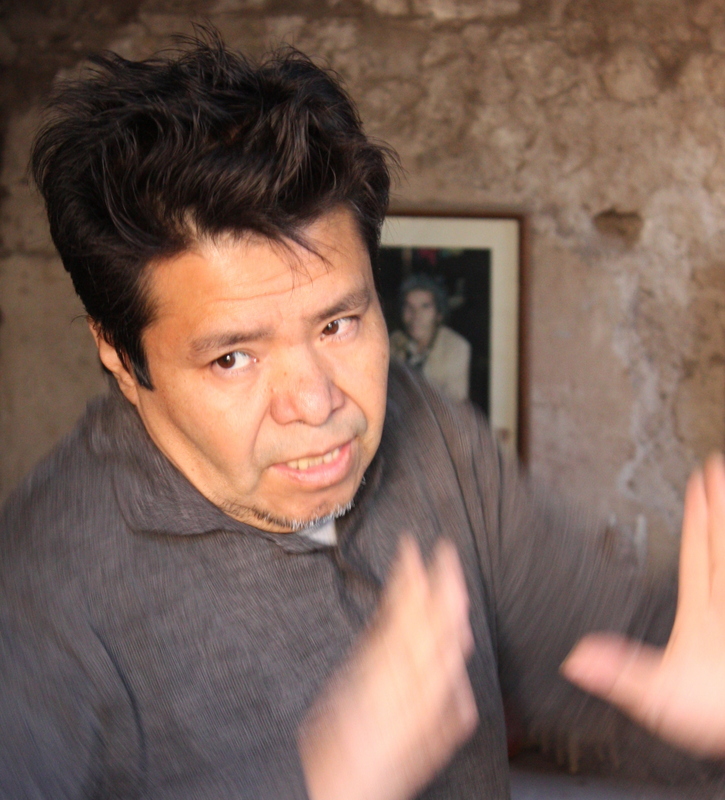 I first met maestro Martín Ibarra Morales last November when – as one of the artisans invited to Ajijic’s annual Feria Maestros del Arte – he and his family were my houseguests. 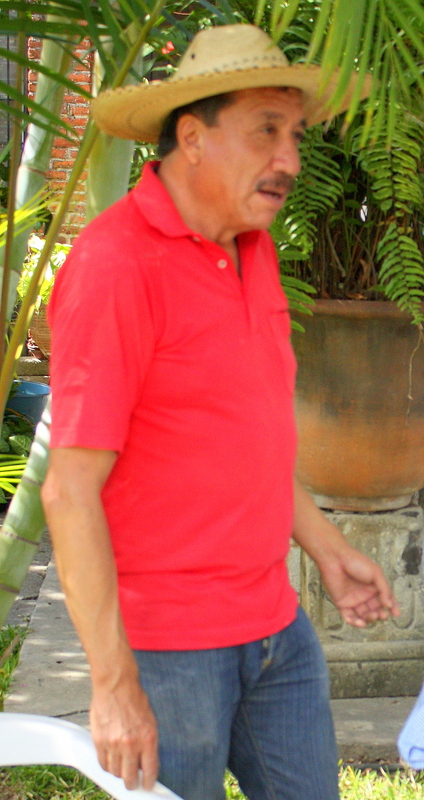 Martín is a clay sculptor whose work is collected worldwide. His renowned artisan father taught him his craft, and he’s most well-known for his intricately formed and painted virgins and globes. 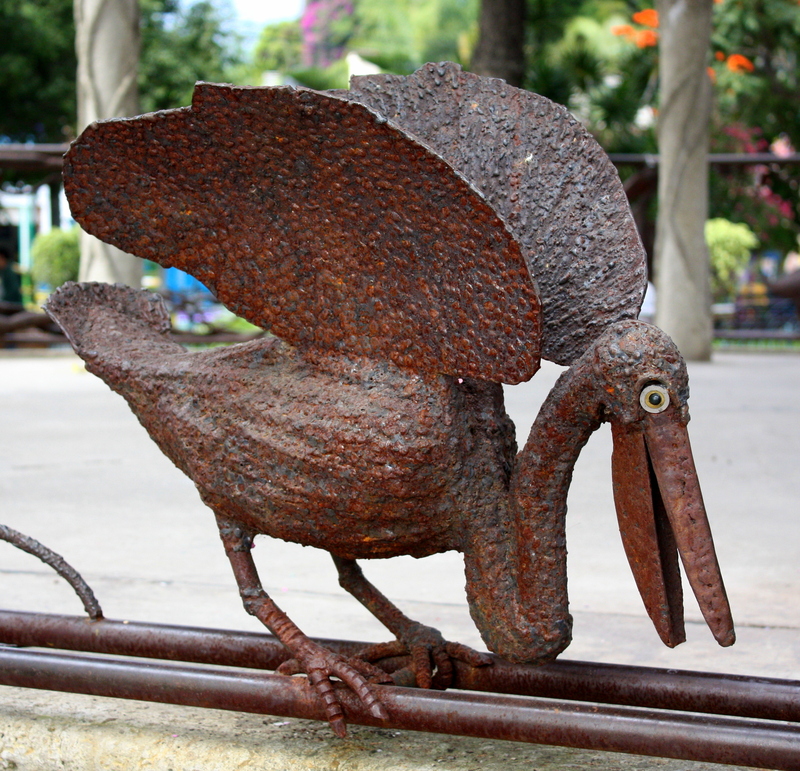 He lives on the shore of Lake Chapala’s smaller cousin, Lake Cajititlan, in the village of San Juan Evangelista which is – as the crow flies – not 15 kilometers from Ajijic. The driveable route around the mountain is about twice the distance. 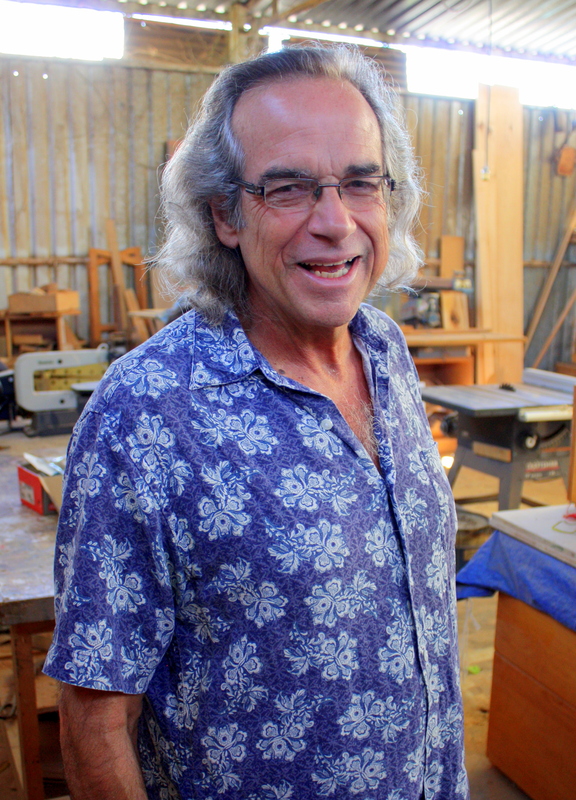 Traveling with me is friend and Ajijic artist Jesús López Vega, who has an abiding interest in native artisans and is a welcome bridge over the gaps in my Spanish. Our directions fail us just a few blocks short of our destination, but we park along the principal plaza opposite the church and graveyard and strangers direct us to a home walled in adobe brick; Martín is clearly also a local celebrity. A small foyer opens into open air patio, its brick walls adorned with framed news clippings and certificates of recognition, and tables covered with some of the maestro’s work. We turn the corner into the studio, a Spartan room in aged brick and stucco. On a table at its center sits one of Martín’s celebrated virgins, which looks to my untrained eye nearly finished. Works in almost every stage of completion seem to take up every square inch of the room, ranging in size from clay whistles that rest easily in the palm to Aztec statuary nearly as tall as Martín’s diminutive frame. Martín is soft-spoken, but not shy, and as he warms to the conversation he talks animatedly, punctuating remarks with his hands. Often he’ll move the conversation to a quickly sketched explanation of his point. 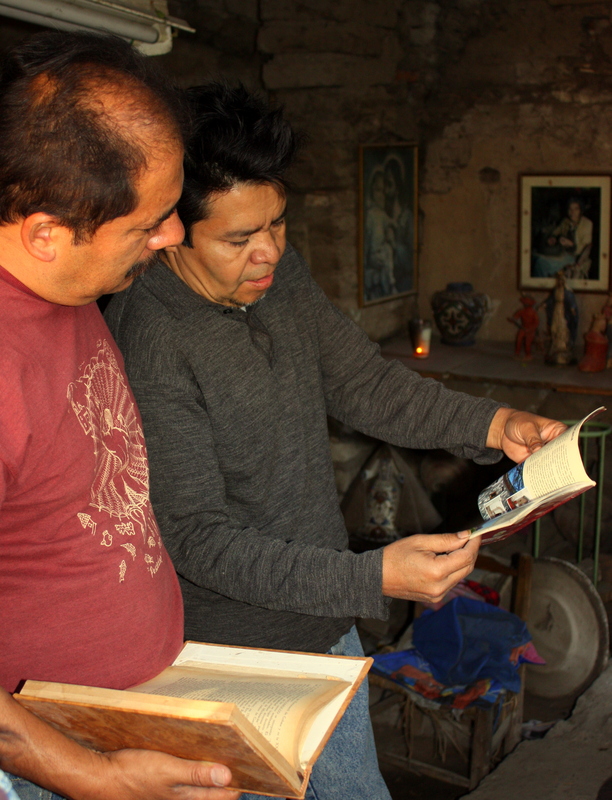 He and my artist friend Jesús quickly plunge into rapid-fire Spanish, comparing notes from old texts of art history that trace the origins of their work back to pre-Hispanic traditions. Their Spanish soon races past me and I wander the studio as they talk. A statue looking for all the world like a recently excavated museum piece stares at me impassively. 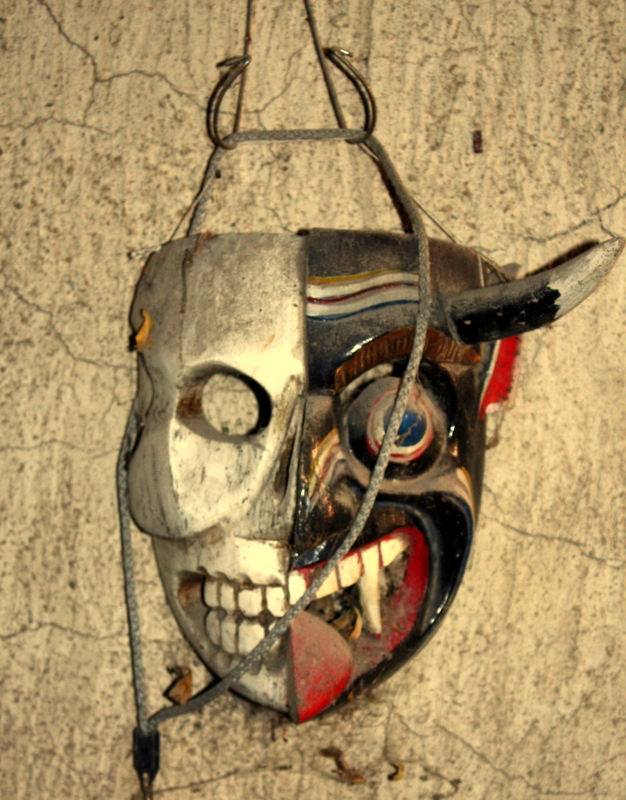 A devilish mask simultaneously smiles and leers at me from the wall behind it. 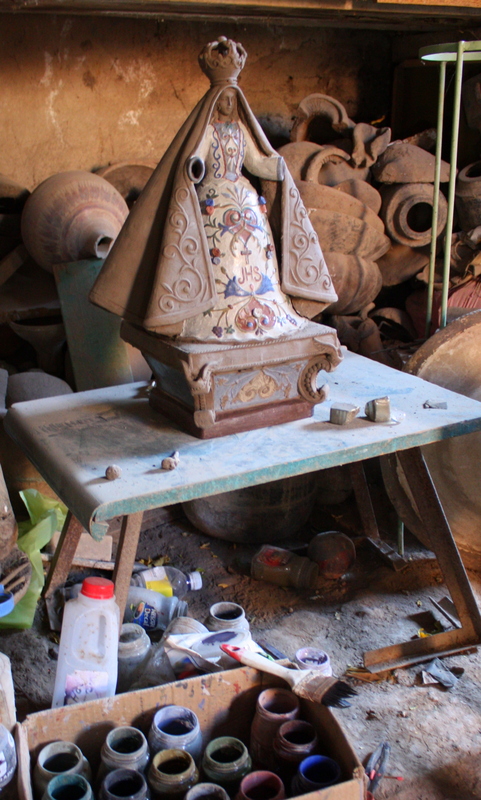 In one corner finished work sits on a mantel above a brick kiln, its face smoked black by decades of use. 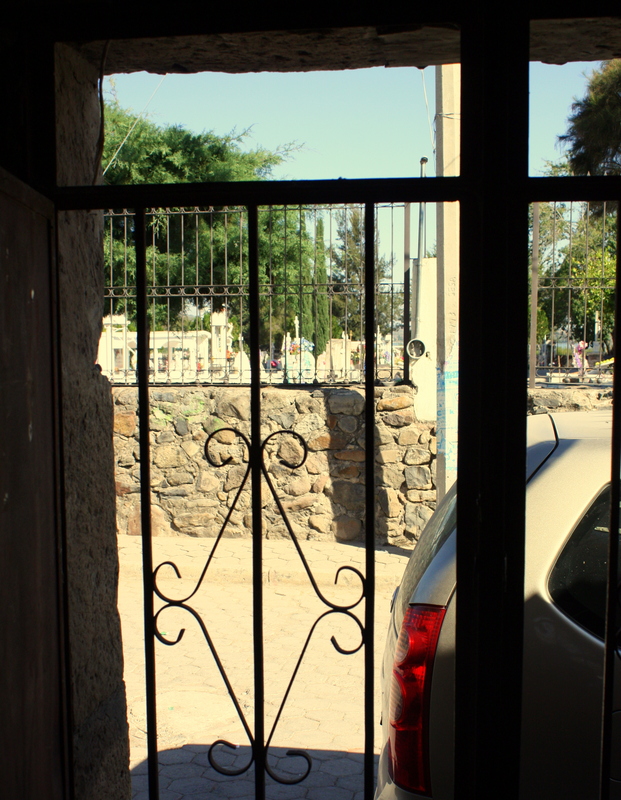 Just as it seems that the visit is about to draw to a close, Martín points through the gate past the cemetery to the church beyond, and asks if we would like him to take us on a tour. Santa Cruz de la Soledad is less than 4 kilometers east of Chapala, but by many measures it’s separated from Chapala by light years. It sits back from the coastline, connected to a string of even more remote villages by a road that seems to shrink as it unravels, seemingly a road to nowhere. The villagers here have fished or farmed for generations, but these days more of Santa Cruz’s 1,700 souls farm maiz, calabasas, and frijoles than fish the lake. It’s not a lucrative occupation, and it only takes a quick walk through the village streets to confirm that prosperity has largely passed this place over. I’m here with my Cuban-American friend Alberto to see in action a program that teaches carpentry skills to at-risk youth, and which he has helped to jump-start. Upon arrival we pass through a modest house and small courtyard to reach the carpentry shop. 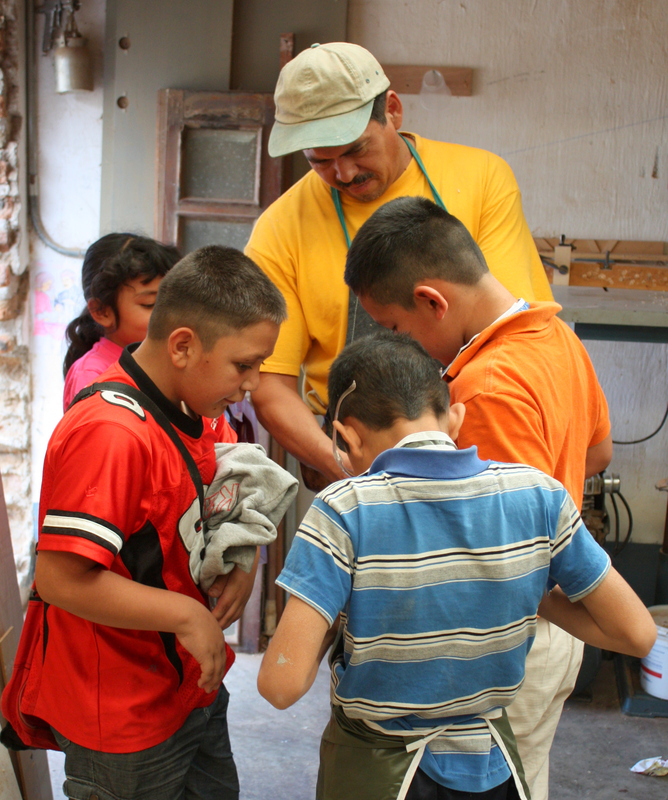 Here Joel Morando, carpenter and volunteer instructor, patiently watches and coaches a dozen children doing everything from operating a jigsaw to painting items that they’ve fabricated. 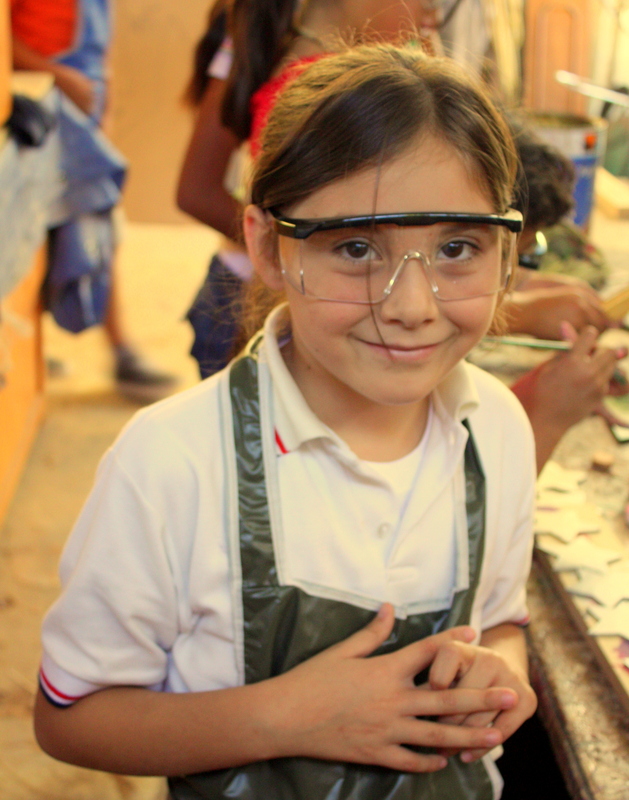 Their finished work is sold to the public, both to help make the program self-supporting and to teach the children not only how to make their products, but also to market them. These children are 9 or 10 years old, but there are no childish hijinks going on here. 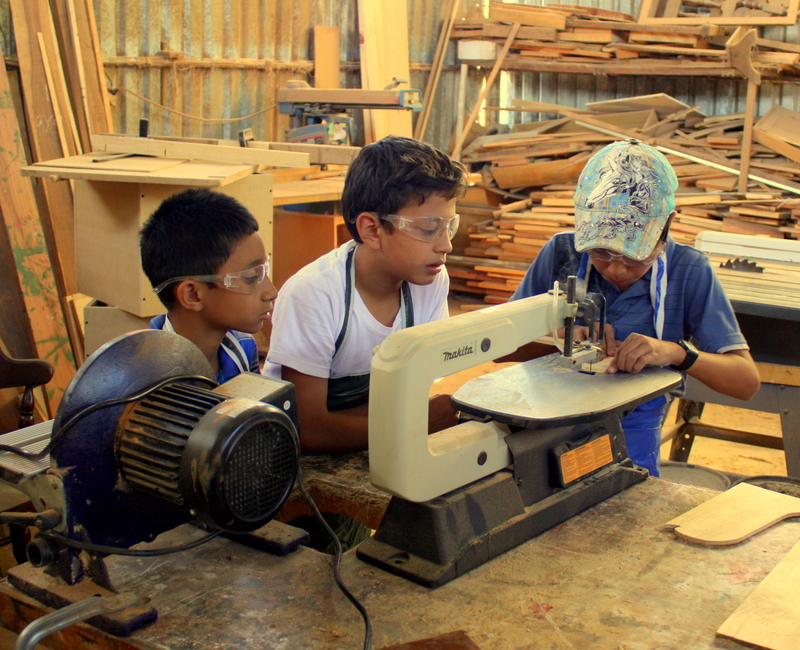 All are intently focused on the work at hand, watching earnestly as each takes a turn at working the power tools. About a third of the students are girls. Alberto tells me that there’s a waiting list of students hoping to enroll in future classes. The kids are at first a bit shy. The children seem at first shy as I begin to snap photos, but then one asks to see the digital image on the camera screen and suddenly I’m surrounded by others asking me to take their photos. After each shot I’m obliged to turn the camera around so that all can see each image, and there’s lots of laughter and chatter as each portrait is revealed. As a parting gift Joel is presented with the donation of a first aid kit that’s been on his wish list. 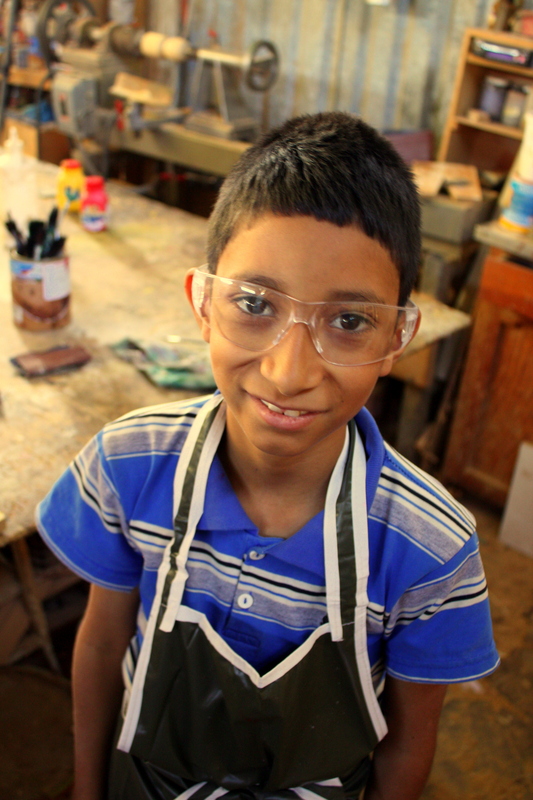 Older kids are just beginning to arrive for their advanced apprenticeship as we depart. 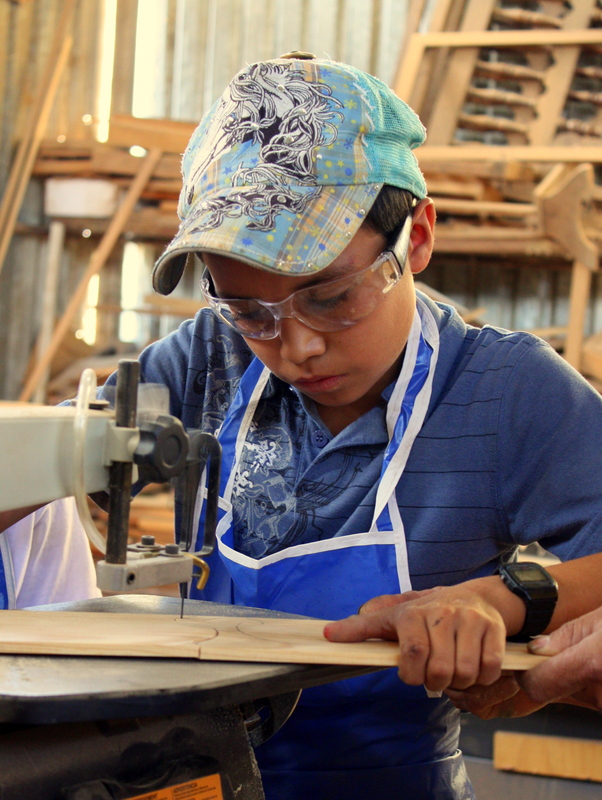 Alberto next takes me a few doors down and introduces me to community advocate Antonio Morales, where in short order I come to understand that the children’s carpentry program is only the tip of Santa Cruz’s self-help iceberg. 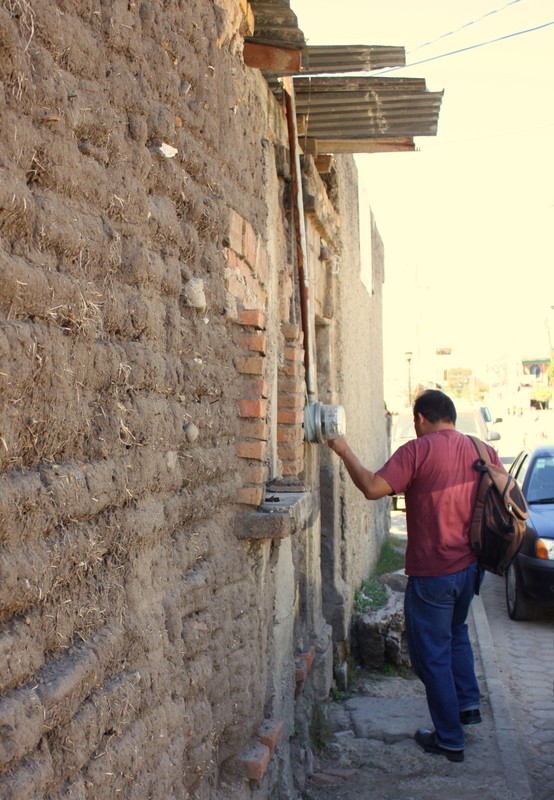 Antonio is quick to laugh and his compassion for his neighbors shines through when he talks about projects – some already launched and others not yet hatched – for their betterment. There’s also a steadfastness about him that leaves no doubt about his willingness and ability to drive hard bargains where the welfare of his neighbors is concerned. 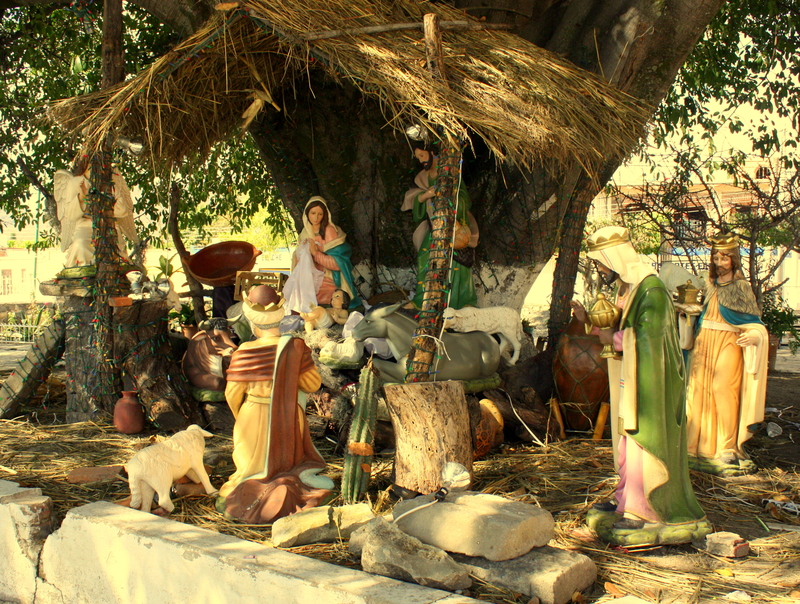 On this day it’s less than a week after the Dia de los Reyes Magos – Three King’s Day – and as we pass through the plaza a life-sized nacimiento is still arranged there. 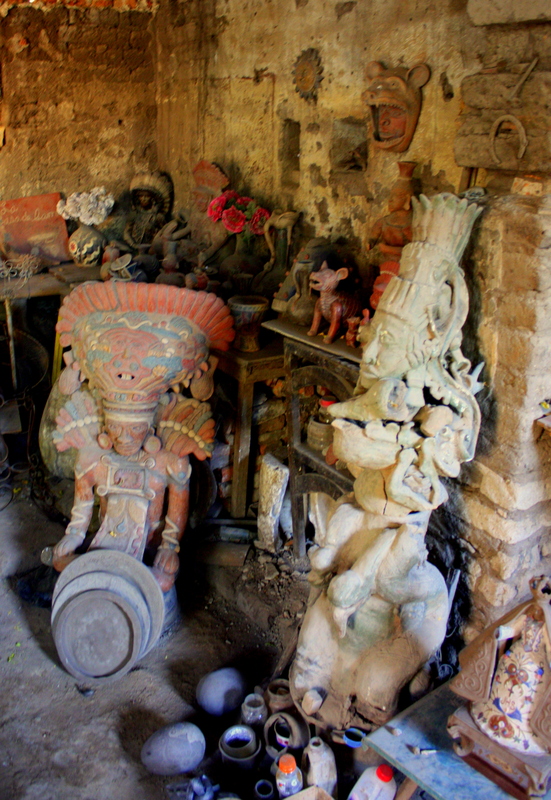 These figures were annually borrowed for many years until Antonio talked the owners into donating them to Santa Cruz. The features of thes statuary are predictably, if incongruously, European. 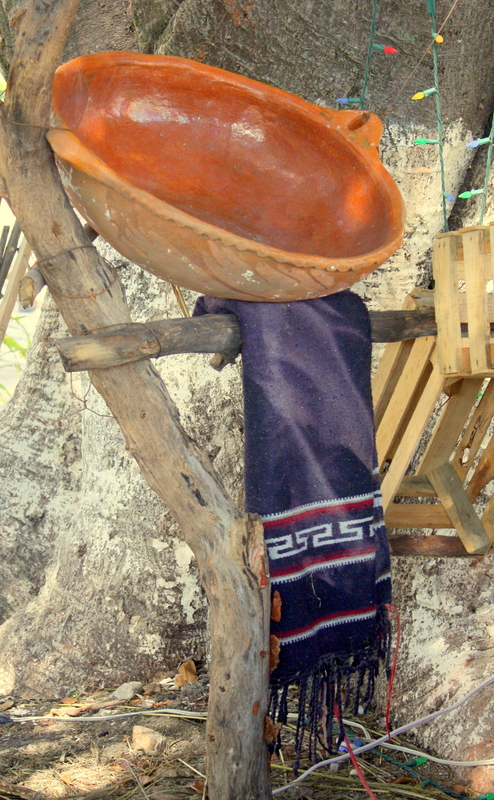 The village, though, has placed its own subtle stamp on the tableau: At the edge of the scene beneath a Mexican clay pottery basin hangs a hand-woven blanket that Antonio tells me is nearly as old as the village itself. 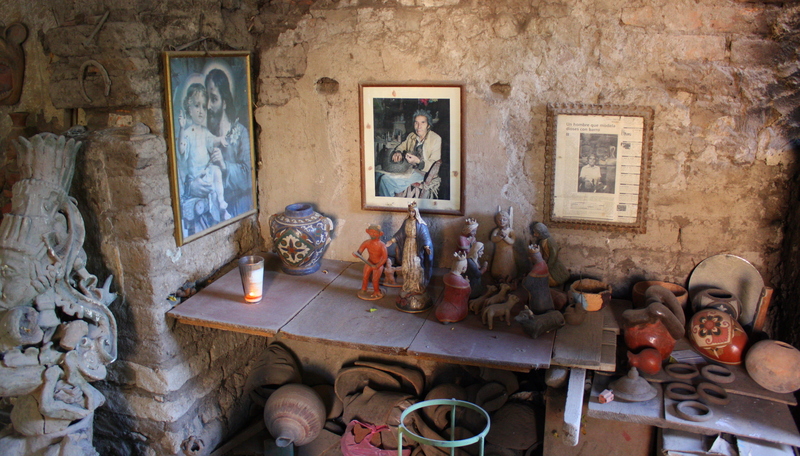 In Antonio’s nearby house it becomes obvious that the nacimiento gift pales in comparison to donated goods of every kind that he’s collected. Clothing. Walkers for the disabled. Books. Children’s toys. It resembles a flea market except that nothing’s sold here, but rather freely distributed within the community on the basis of need. 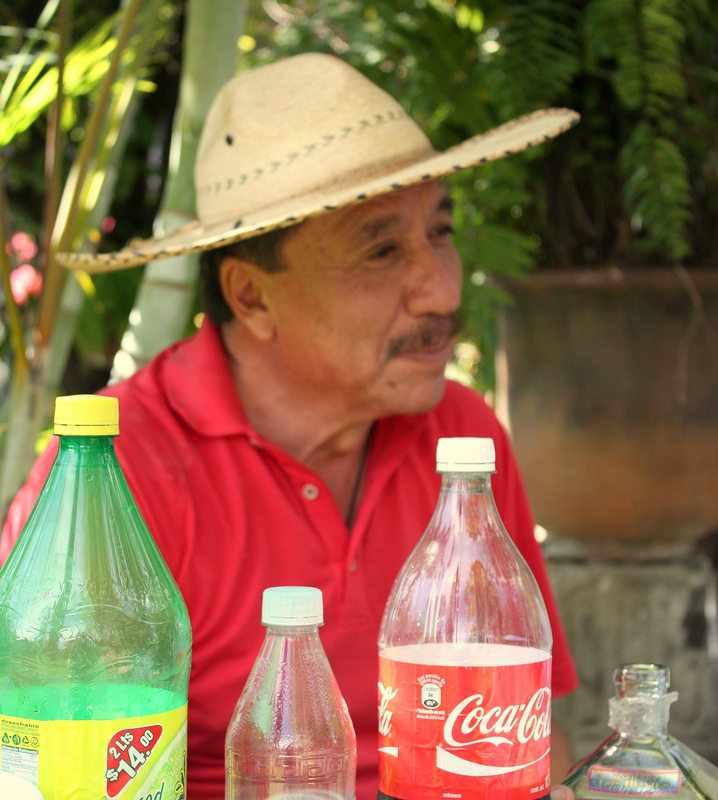 On a table in the jardin out back sits a bottle of Antonio’s favorite tequila, and as our visit draws to a close we’re obliged to accept his profered hospitality. Purists may drink it straight up, but for everyone else he has set out mixers: There’s the perennial Squirt, which makes a sort of lazy man’s margarita, or (the first time I’ve seen this) Coca Cola! As we sip the elixir, the air is suddenly split by an announcement in blaring over a loudspeaker, and it recalls for a moment the recurring P.A. announcements in countless episodes of M.A.S.H. In a town without its own newspaper, loudspeakers perched on poles strategically situated throughout the village are the way that folks get their local news. It’s a low-tech solution perfectly suited to the need. It’s almost time for us to leave as Antonio begins talking enthusiastically about another unfolding project that will teach local farmers how to raise moringa trees, the leaves of which are so rich in vitamins, minerals, and proteins that they’re often called “the super food”. The fast-growing crop fetches a healthy price on the world market, and promises to help even more of Antonio’s neighbors pull themselves up by their own bootstraps. A few local farmers have already sprouted the first moringa seedlings, learning how best to cultivate and care for them so that their experience can be shared with others. Hopes are for a first crop before this year’s end, and I’m eager to return and see the result! 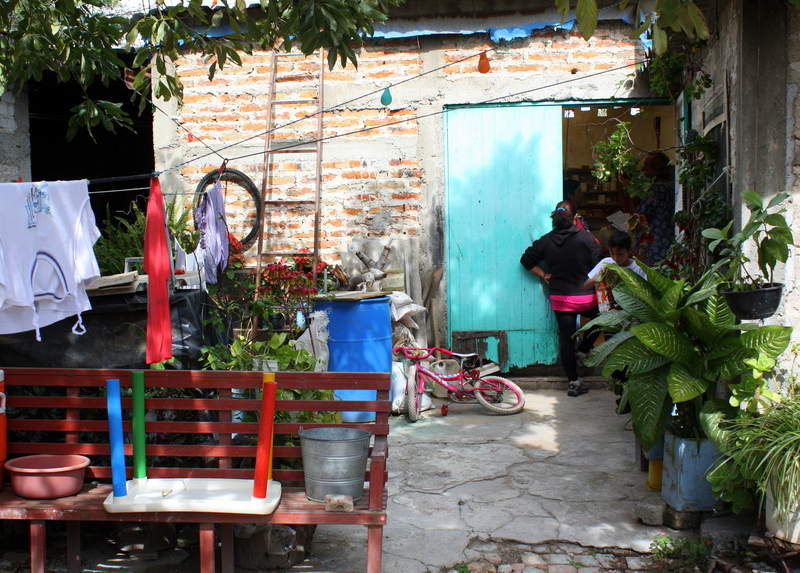 Afterwards as we head back through Chapala, I reflect on the amazing enterprise demonstrated by people who so ably apply what little they have to better themselves and their community. There’s little here by way of a social safety net except the support that these villagers readily give to one another… but which is clearly priceless. 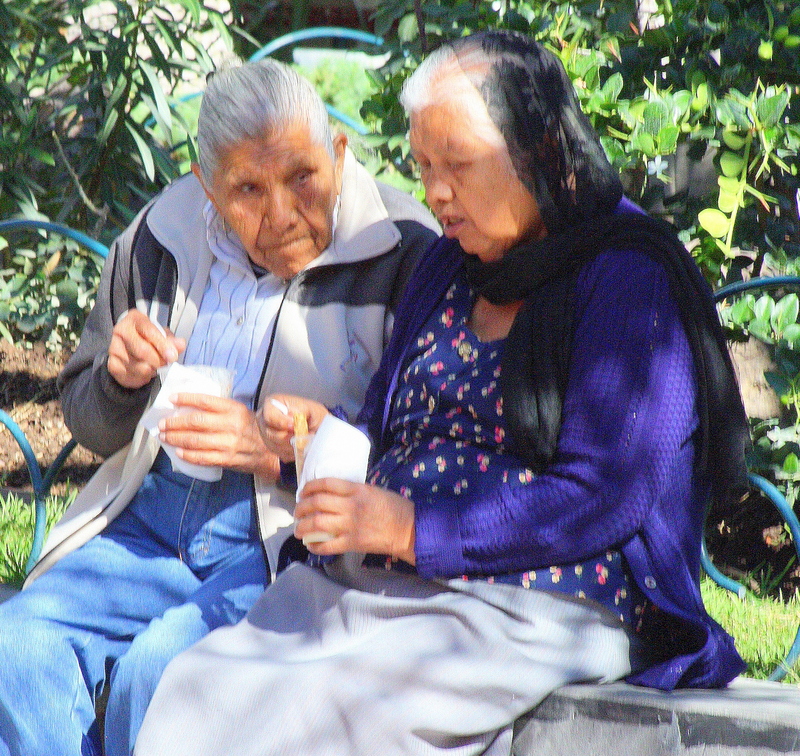 Few contrasts between American and Mexican cultures are more striking than the way in which each views and treats its senior citizens. Old friends share a bench on Ajijic’s plaza. 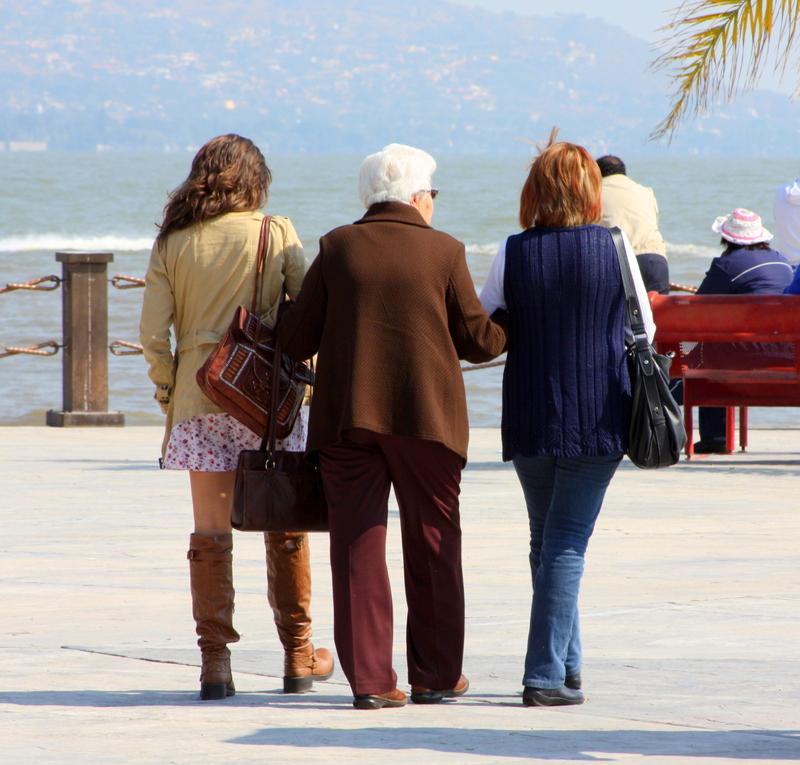 America’s seniors are often cloistered in assisted living facilities or nursing homes far from family and friends. 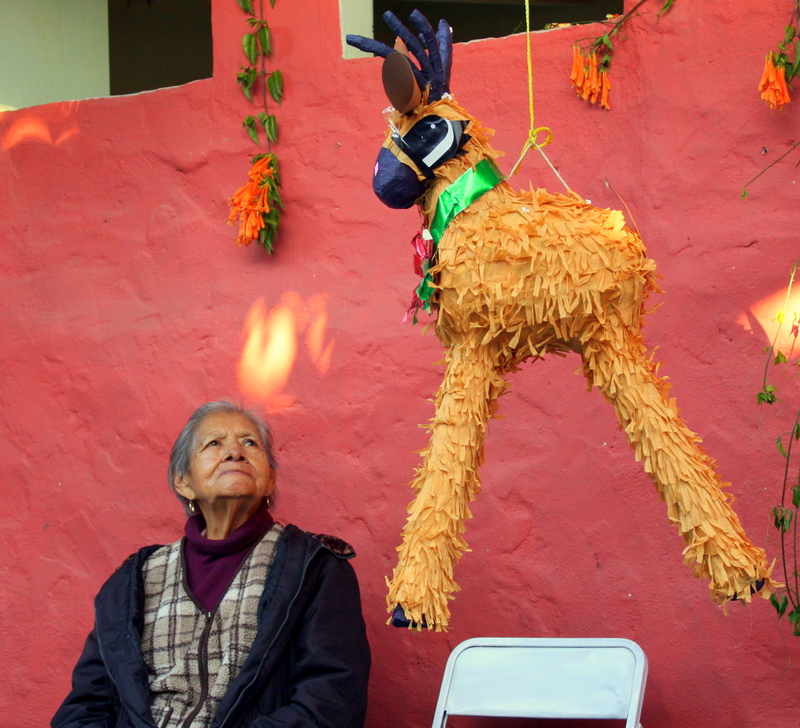 Mexico’s oldest – los ancianos – seem more often vibrant alive and interactive, and are notably present in its public life nowhere more than in its villages. 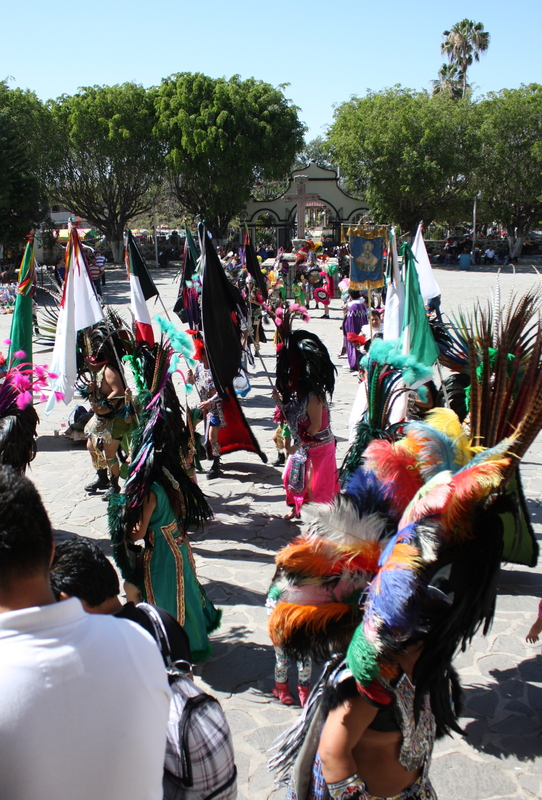 A ritual gathering of los viejos on Chapala’s plaza. It’s hard not to see the paradox in these contrasts. American has a far superior capacity to maintain its seniors’ quality of life, and has taken great pains to make transportation and public use facilities accessible to its disabled. 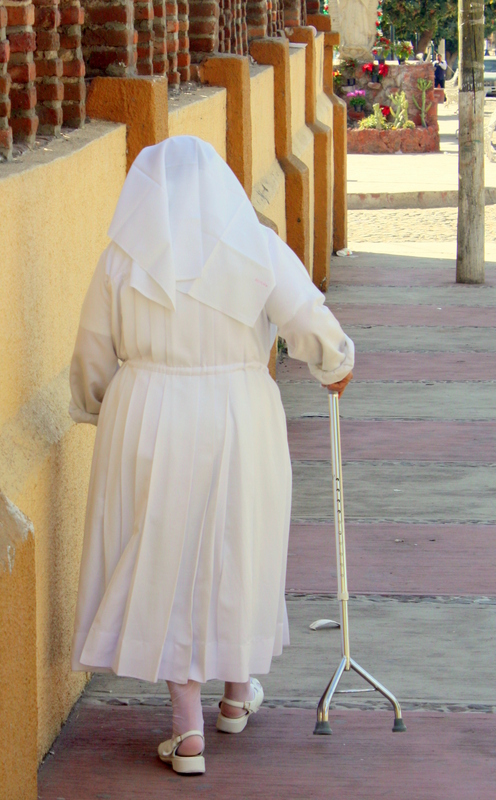 It has also segregated its seniors from the social mainstream on a wide scale. 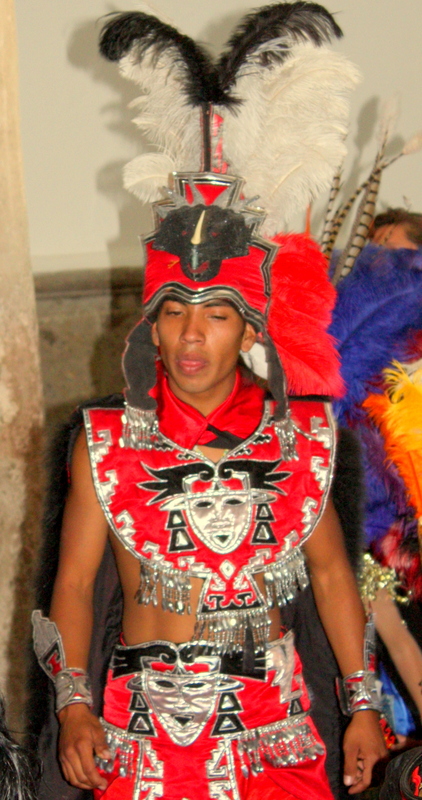 The paradox is a reflection of the two nations’ cultural perspectives. 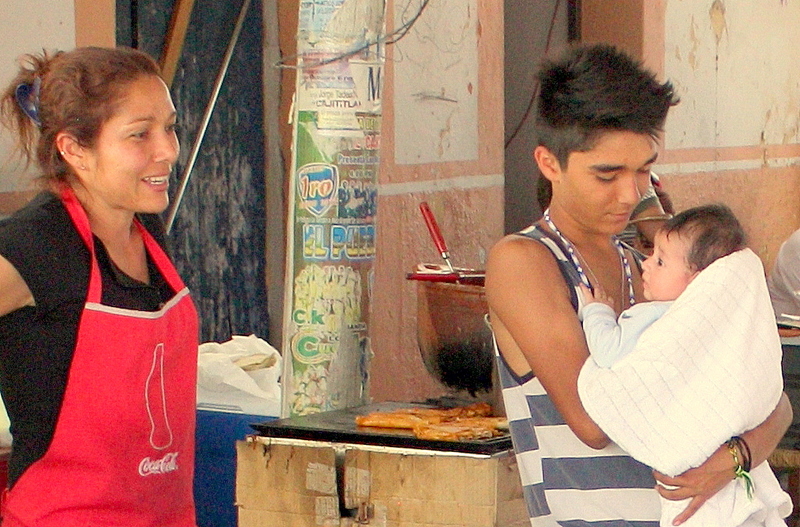 In Mexico, ‘family’ trumps ‘generation gap’. 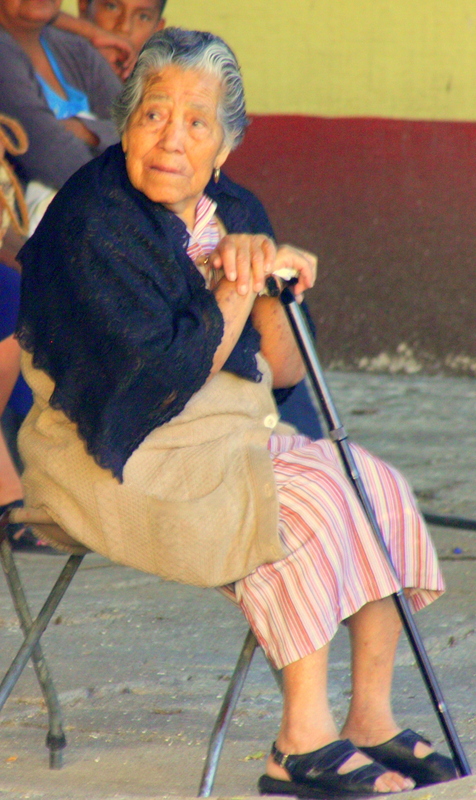 Mexicans are far more likely to respect and cherish their oldest generation and revere it for its wisdom and life experience. 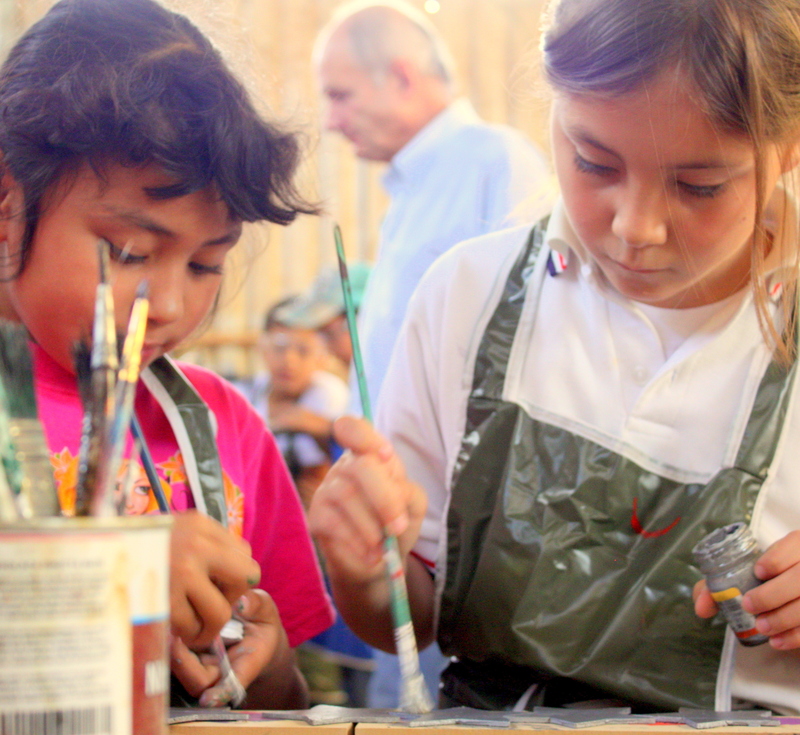 Many among the current crop of los ancianos are the children of those who participated in the century-old Mexican Revolution. They’ve witnessed and lived history as it’s unfolded through the greatest social transformation in the nation’s history. American media’s fixation on youth marginalizes its oldest save for the rich, powerful, or otherwise famous. The result is that America’s aged seem more often perceived by their offspring as an unpleasant reminders that they, too, will in due time grow unfashionably old and less socially relevant. 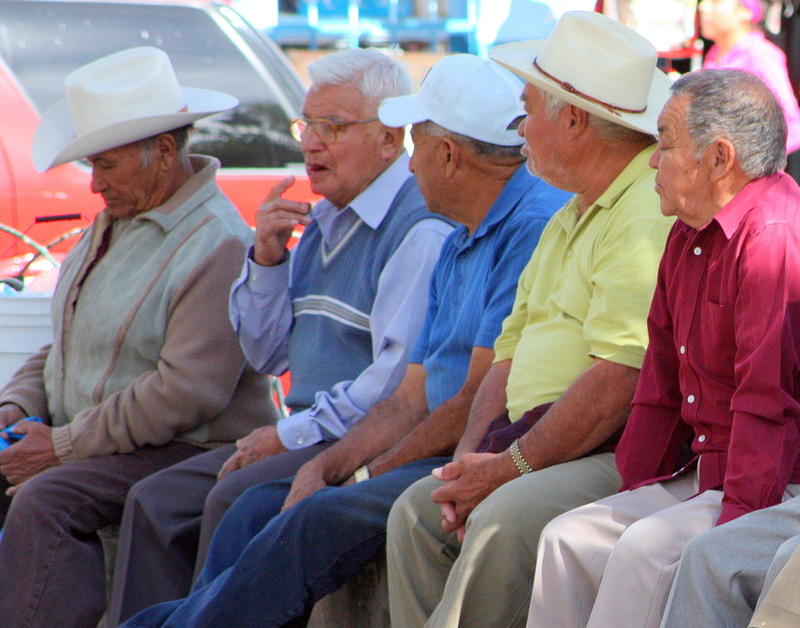 Particularly in Mexican village life, los ancianos remain connected to lifetime friends and many live within their extended families. 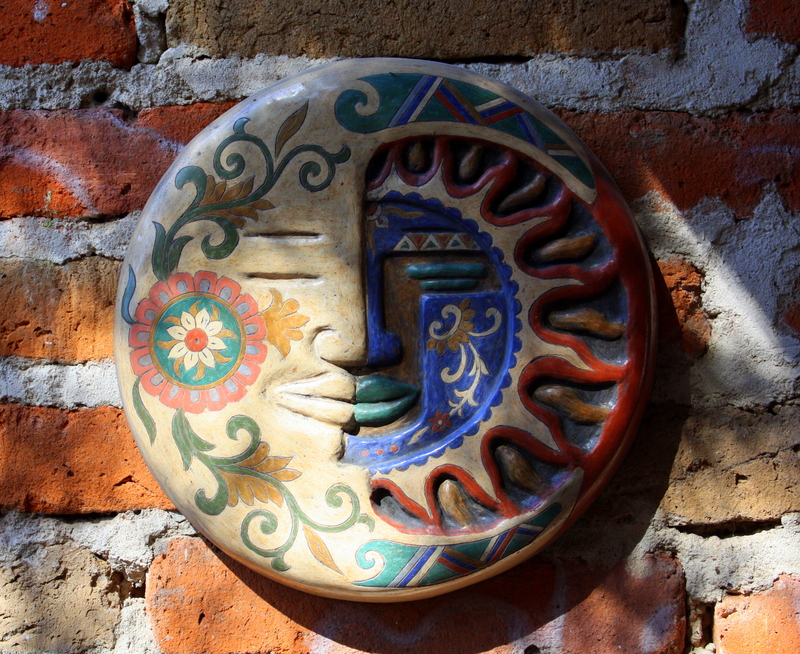 The artisan maestra looks up from her work in satisfaction. There’s a lot to suggest that this lifelong connectedness affords them greater comfort in their advanced age. Americans move further and more often from their place of birth than do those living in any other First World nation, with the result that they more often live far from the oldest among their living relatives. Affordable senior care facilities make it far easier for American families to live separately from their aged relatives. 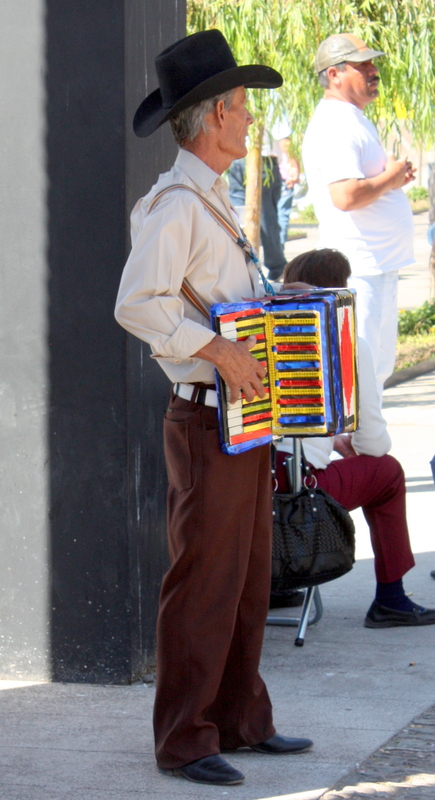 Maybe there’s also something also to be said for lifestyle when it comes to keeping Mexico’s ancianos animated and mobile. 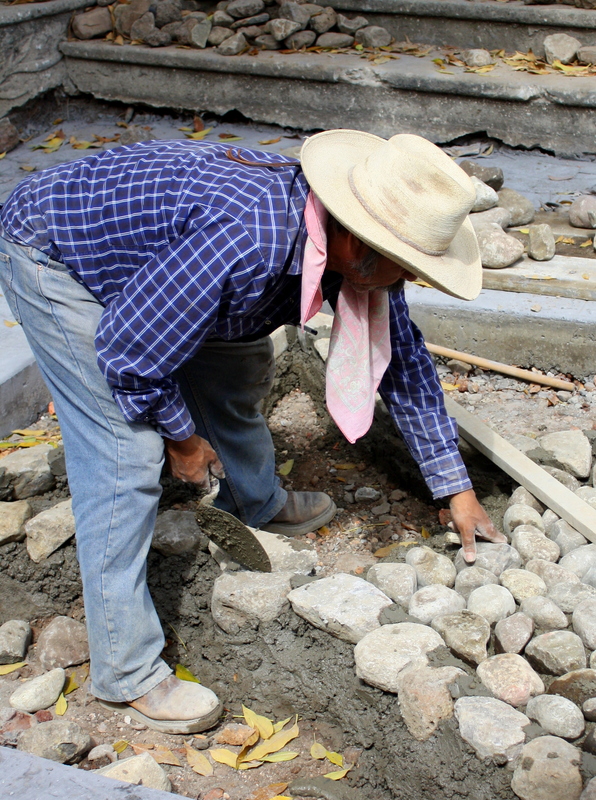 Economic necessity and a thinly stretched social safety net keep many Mexicans working into advanced age, but the work seems to leave many no worse for wear and sometimes even to hold disability at bay. A lifetime of meals simply and sparingly prepared has left many lean wiry. 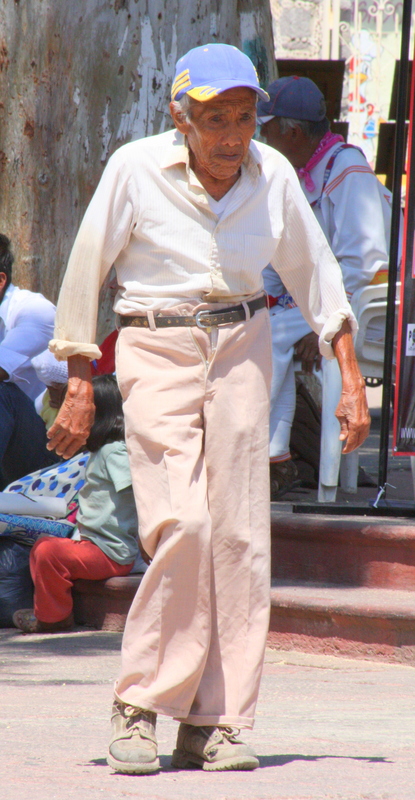 It’s not unusual to see these ancianos navigate dauntingly high curbs and cobblestone streets to remain a daily village presence on its sidewalks, in its public spaces, and at its public events. 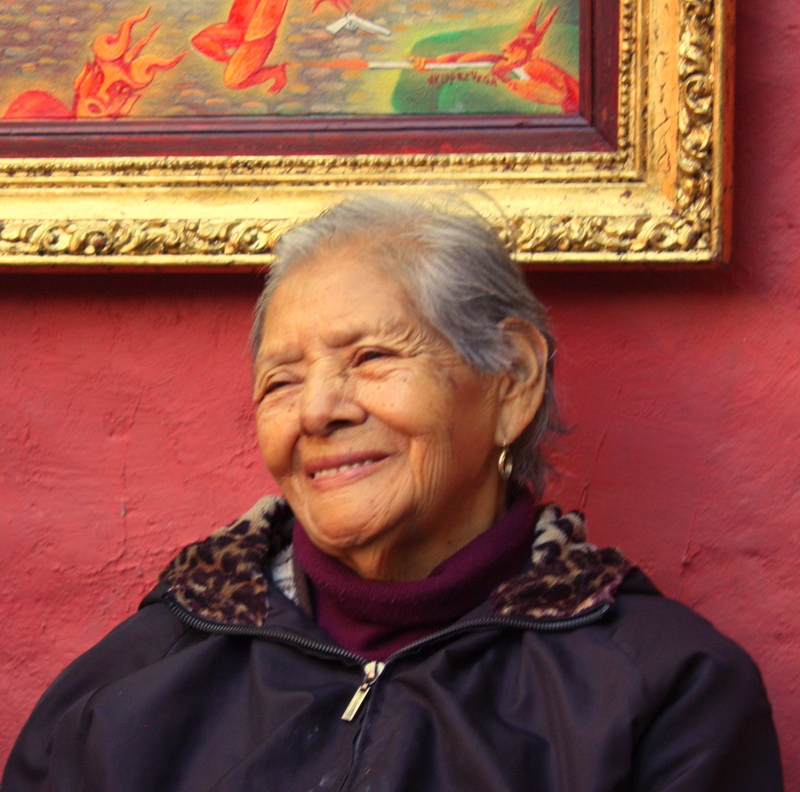 In the end, though, nothing can better capture the special place that Mexico’s ancianos occupy in its social fabric than their images. The moment that I walk through the doorway of Colon #15 only a few blocks from San Cristóbal Zapotitlán’s central plaza, I realize that the Ostrich Ranch tour is about to be displaced as the high point of my trip. The rooms are typically small, the walls stuccoed and the floors tiled. The house is sparsely furnished except for a well-worn display cabinet and shelves on which stands a virtual army of intricately fashioned miniature figures, dozens of woven baskets, and vibrantly lifelike artificial flowers. A bride and her entourage stand in immaculate sepia before an unseen altar. Lambs stand at the side of the manger in a Christmas crèche. In the next room bundles of palm leaves, sliced into narrow strips as tall as a man, stand drying. 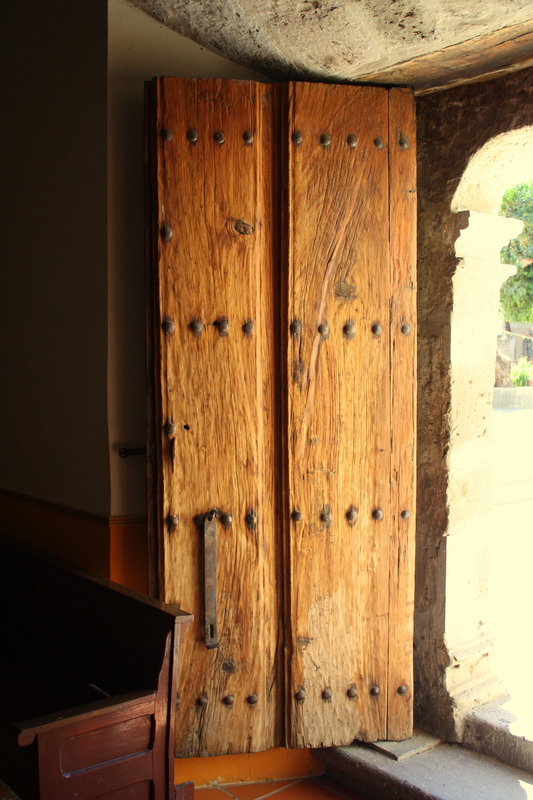 Another doorway opens onto a softly lit room with a ceremonial feel. Selections of the handiwork sit on covered table and I move toward them for a closer look. Just to the side of the door behind me an ancient woman seated on a low stool is weaving the palm strips into a basket. Her shoulders are stooped and her head bowed over sturdy fingers. She wraps the palm tightly and densely to fashion trays, baskets, and vases that are at once pliable and sturdy. 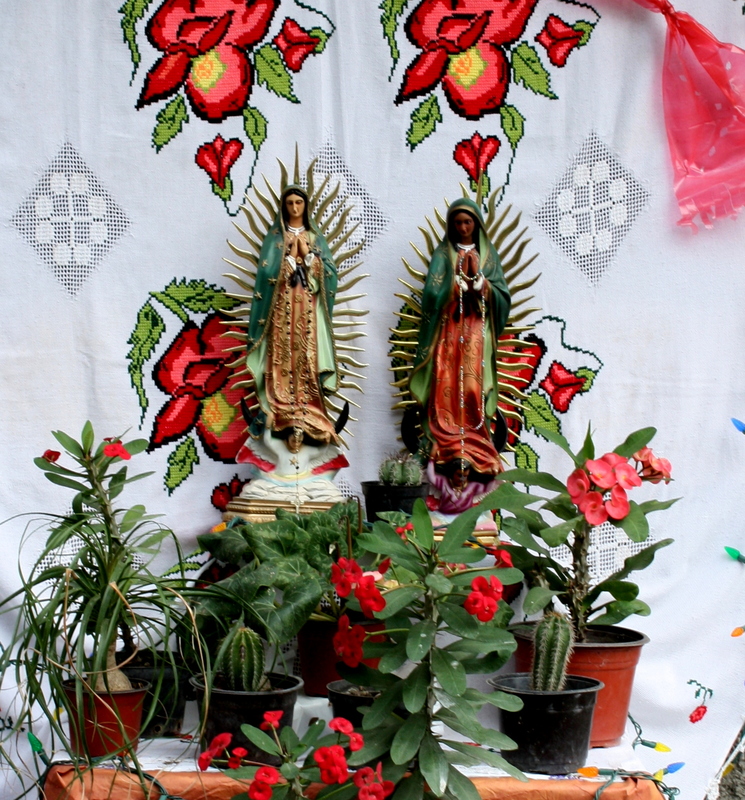 Two women seat themselves on a bench behind the table and a pile of dried and brightly colored corn husk leaves – hojas de maiz – and begin before my eyes to fashion the kinds of miniature figures seen in the front room tableaus. They work with a quiet intensity, their fingers so automatically folding and twisting and wrapping the leaves that their eyes seem less to guide than to observe. 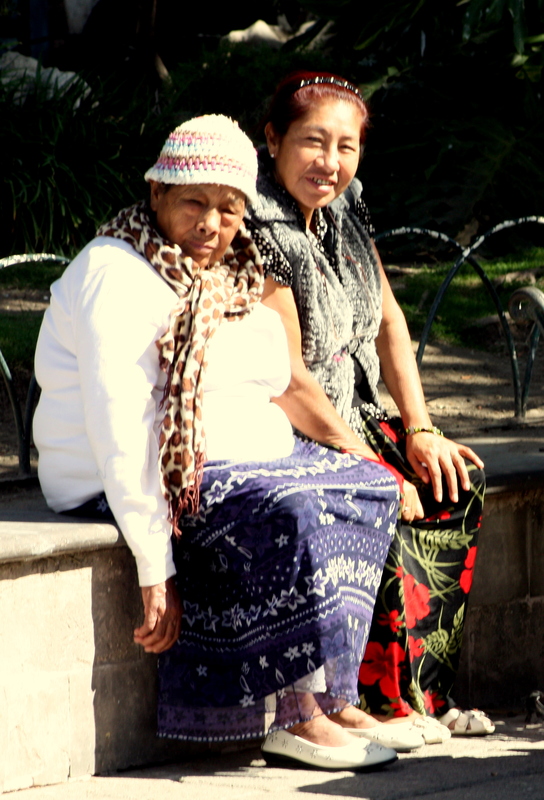 Three generations of women have built and continue to work this cottage industry artisan enterprise. Some of their photos hang on the wall of this room. Back in the entry room Herlinda (I know her from Ajijic’s Friday Artisans’ Market), is joined by a young woman and the two of them quickly begin another demonstration of their craft. 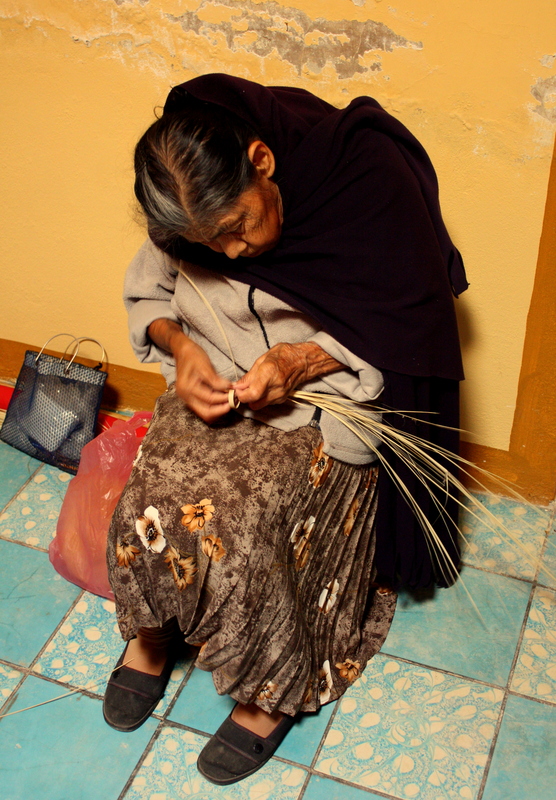 The young woman threads small bits of violet corn husk together much as a sportsman might craft a fishing fly. It turns into a flower, followed by another and another until she has crafted a small bouquet. Herlinda, beginning with a lollipop stick bit of palm and folded corn husk, fashions as I watch a tableau of a woman rowing a flower-festooned boat made of woven palm leaf. It’s clear that each of these women has developed a particular skill, and that the success of this cottage industry rests upon their ability to orchestrate their individual efforts to produce endless combinations of artisan eye candy that delight and inspire. All of this is accomplished with apparent effortlessness, a genuinely collective spirit, and an obvious joy in the work. It employs only human energy, and uses only natural, sustainable, and readily available raw materials. 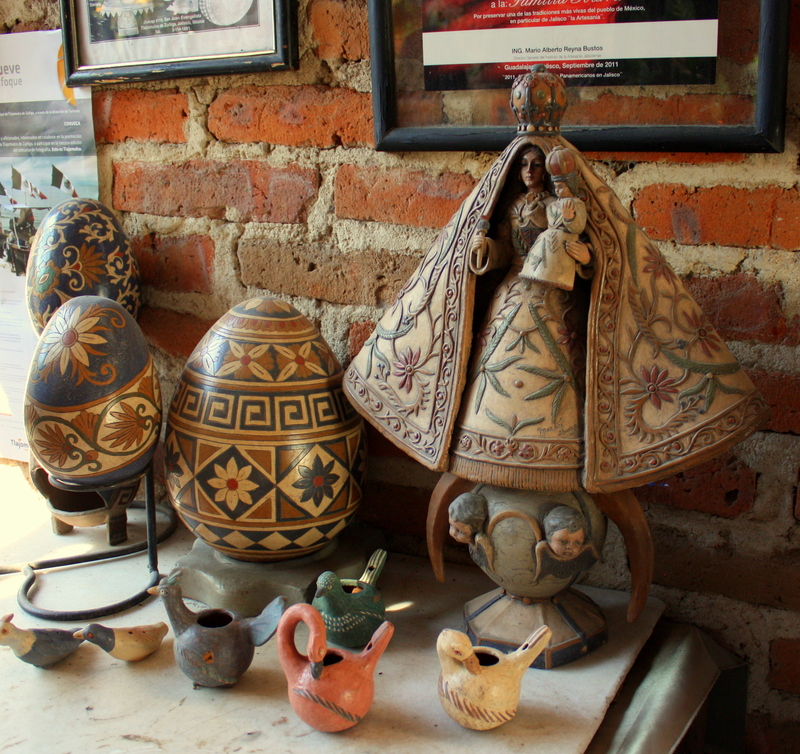 Once you’ve seen the women and the work behind these artifacts, you’ll see their craftwork through entirely different eyes. 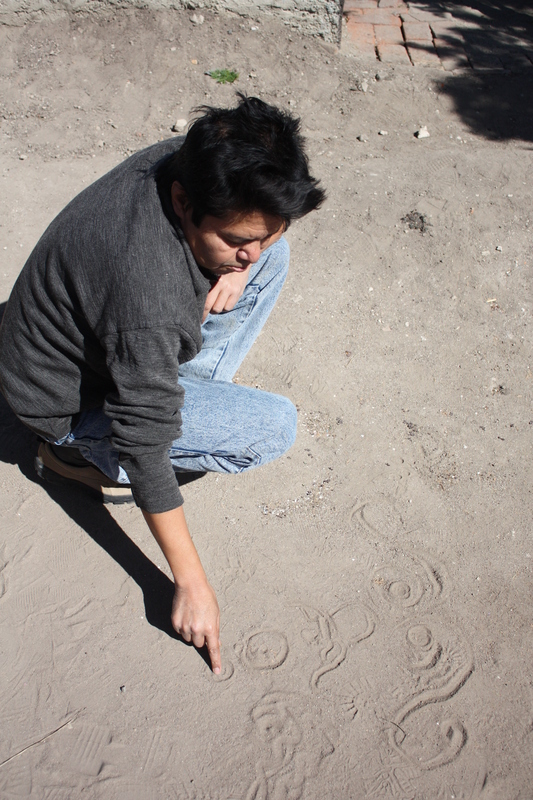 Click here for the account of my trip to San Cristobal’s Ostrich Ranch. 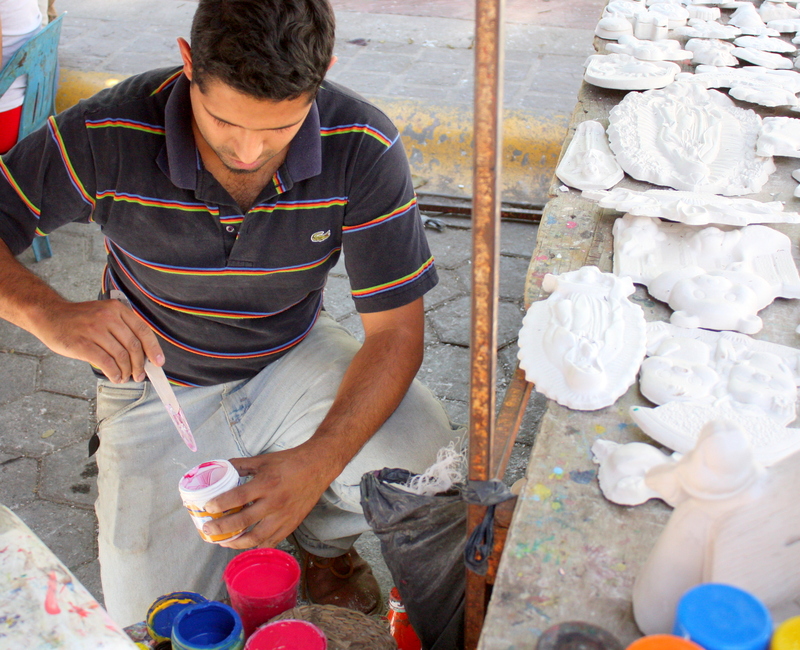 Friday Artisan’s Market Ajijic, where you can meet some of these artisans and purchase their work weekly.